The second day of the completion was the day I was most anxious about: rolling. I hadn’t yet found a skin on frame that would fit well and I was eager to find something that I could at least do a few more rolls in. I had tried Marcel’s kayak but couldn’t do any forward ending rolls. I could do some rolls in the big yellow plastic kayak, but I wanted to see if there was anything else that I could do better in. I tried to get an early start to try figure out the situation. Getting down to the kayaking area early, I came across others preparing for the rolling as well. 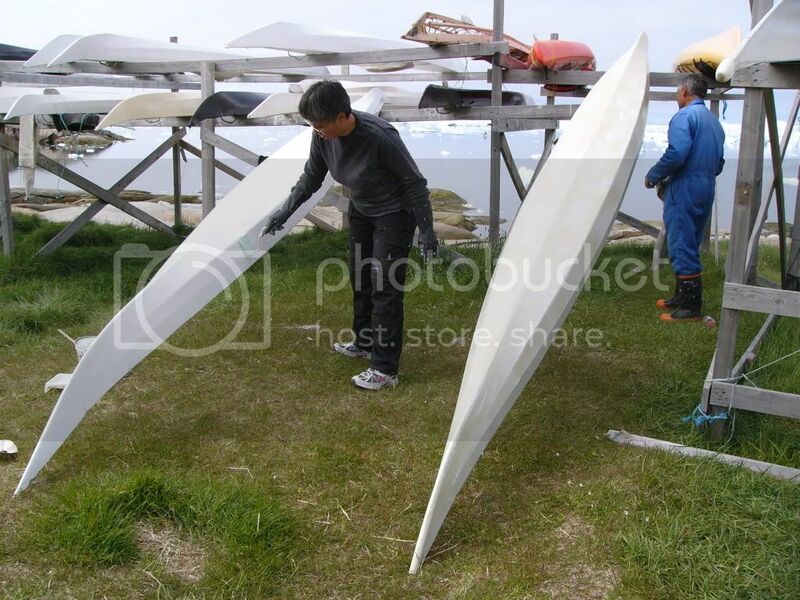 Here is a photo of Karl from Qaqortoq preparing his tuiliq for rolling. He is rubbing whale blubber all over it. We were still trying to figure things out when they announced that they were ready to start and McKinley was up for rolling. She was the only kid who knew how to roll and she had a little audience of people intrigued to watch her compete. They were all suitably impressed, especially given her age. Many Greenlanders do not learn to roll until much older. In fact, only two women in the “competitive” age group 24-35 competed in rolling and only 9 out of 16 men in that age group (Maligiaq’s group) competed in rolling. Jenny and I were the only two females in our age group (35 and up) who participated in this event! Here are a couple photos from several of McKinley’s rolls, see photobucket for more photos of her. One of the rolls requires the use of an avatak, or hunting float. 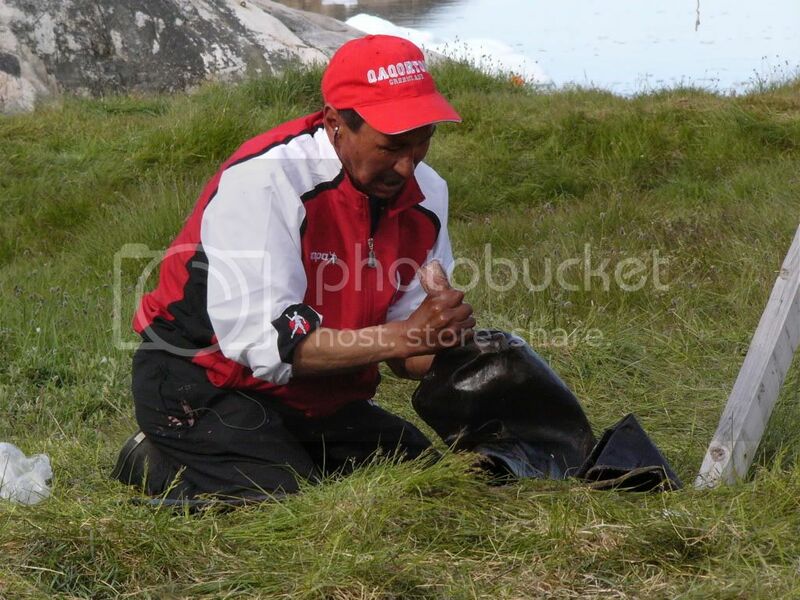 Here I captured Maligiaq preparing the avataq for those who would do this roll. 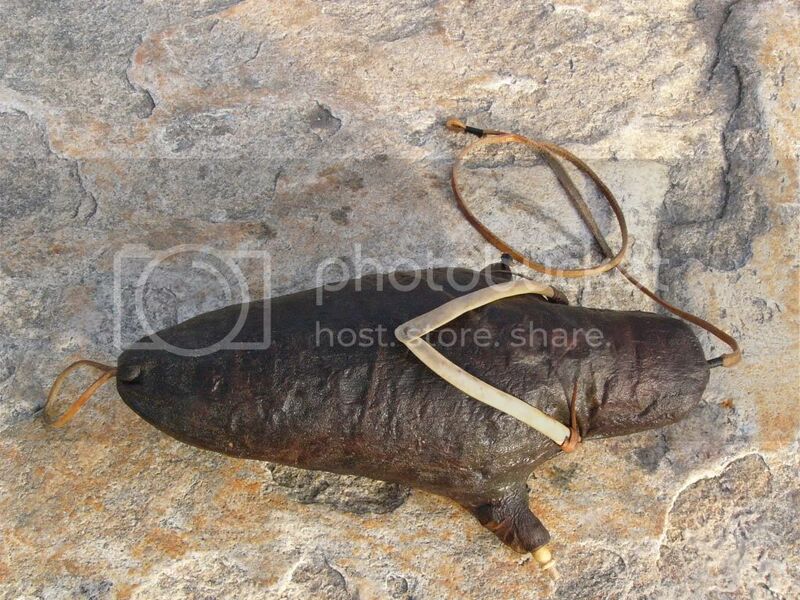 Again, they are using traditional materials, so this is made from a baby seal. Again, see the full slide show for additional photos of prepping the avataq. 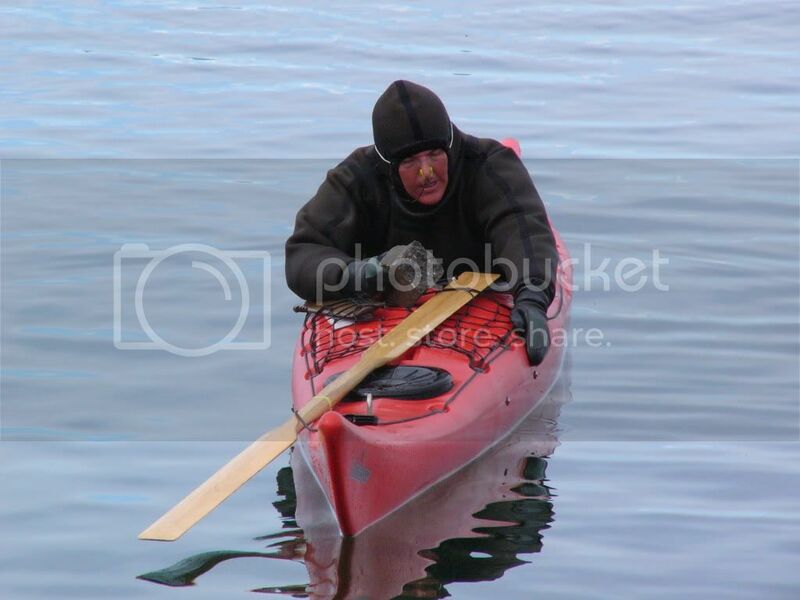 After McKinley was done it was back to figuring out what kayak to use. Jenny was eager to find something too and she decided to try the red plastic kayaks that Kampe rents out to tourists for trips. It seemed to roll well for her so I decided to try it out too. I was just about to get into the one that she had pulled down, but we ran out of time and she was suddenly called to compete! We thought we had more time but we weren’t aware that so few women would be competing in the rolling event and that our names would come up so quick. While she finished prepping I dragged down a second kayak so I could try one out myself and I quickly made the decision that I’d use that red kayak to roll since I could at least do a few forward-ending rolls in it. I gave my camera to Dubside to take photos of us, here is Jenny. Once Jenny was finished, I was up. In an unfamiliar kayak that I hadn’t tried much, I was pretty proud of myself for how I did. I was able to do a number of forward ending rolls and norsaq (throwing stick) rolls. Some rolls felt a little iffy in that kayak on my left side, but I made the attempts anyway and succeeded on many. I know I could have done more in a kayak I was more familiar with or better made for rolling, but I was ecstatic to participate. Here are a number of images of me rolling. Judge’s view - it should be noted that Kampe, who loaned us the red kayaks, was one of our judges. I think he may have been amused to see us rolling big plastic "boats". Showing I still had my arms crossed after coming up for this roll. The water was quite chilly, and by the third roll you do start to get an ice-cream headache, but if you continue to roll it starts to go away (probably from going numb or something). My hands were ok though since I was wearing gloves. 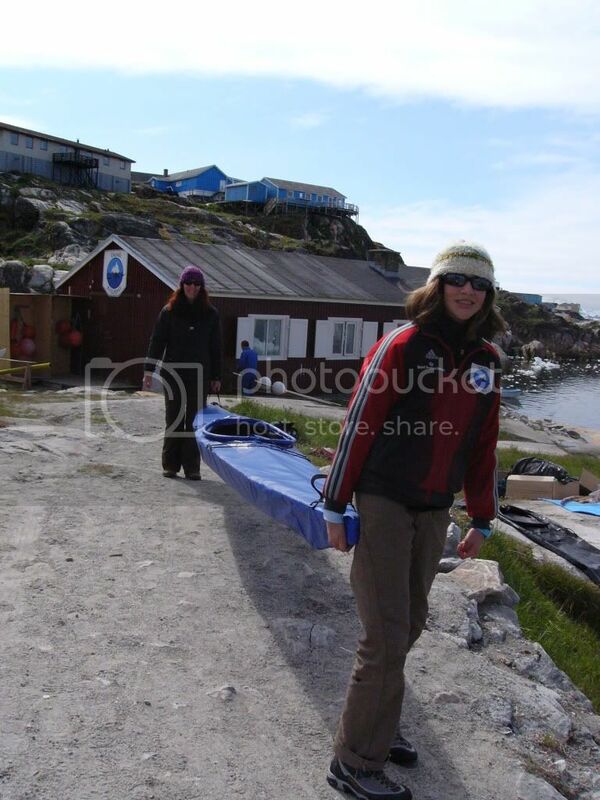 When I was training I would easily go out and roll for over an hour and never feel winded, however I did in Greenland. I think the water temperature was affecting my asthma and it also makes your brain go somewhat numb, but I persevered. I did bring along a laminated list of all of the rolls in Greenlandic and English so when I was going to skip a roll I would say namik (no) or holler out the name of the next roll I knew I could do. Of course my Greenlandic isn’t all that great, but I think they appreciated the effort and were humored by my pronunciations. 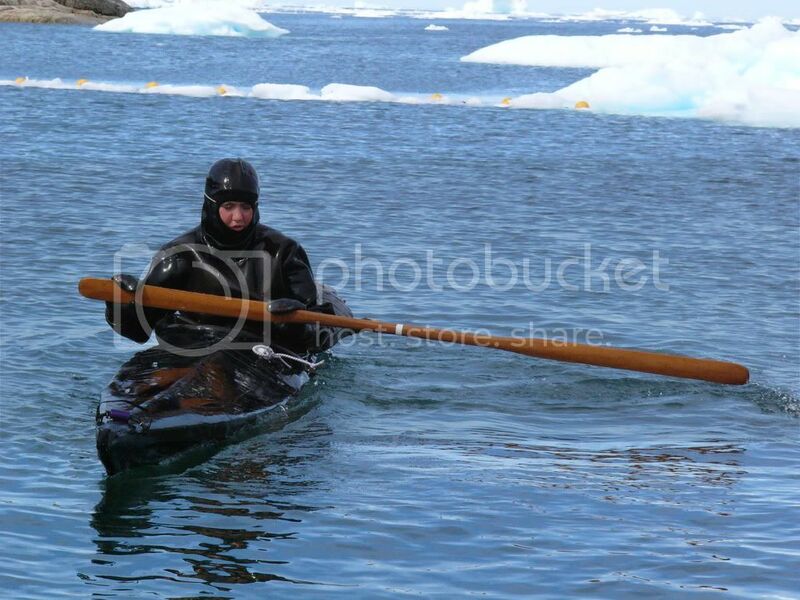 Attempting my Greenlandic while performing my rolls made the experience that much more enjoyable. At the very end I was sure to say qajanoq (thank you) and moved along with a huge smile on my face, I truly had a blast and I was extremely grateful to have a kayak I could at least do some rolls in! After the women, it was time for the guys, as well as kids ropes (future post). I spent most of my time watching the rolling. Dubside took his turn and did fairly well. He was in a borrowed kayak and wasn’t able to do a few of the finer, forward-ending rolls, like the forward fist or brick roll, but he hit many of his other rolls. I did step away to eat at one point so missed the one walrus pull that occurred, but I did see a number of other rollers. It is amazing to me that many of them did not use gloves given how cold the water was. Only one or two people wore gloves which were intriguing: they have two thumbs on each glove!! 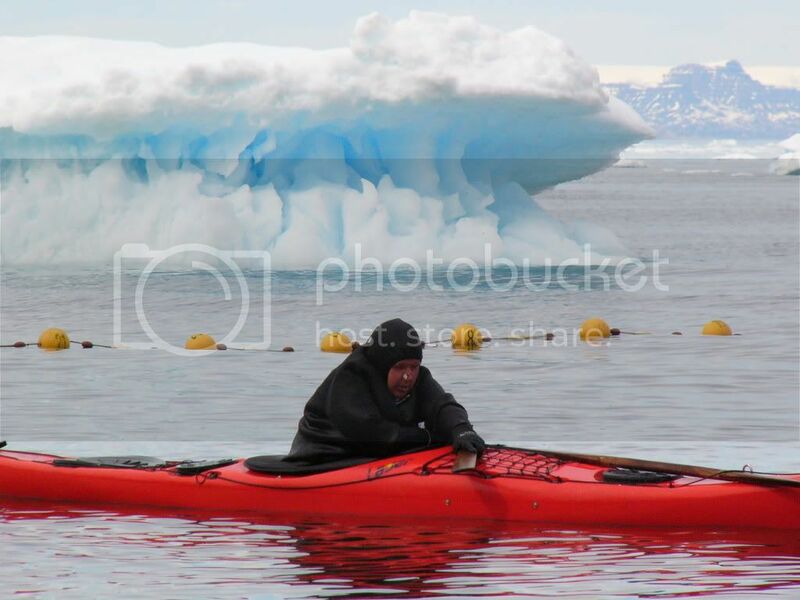 The gloves of course have to be traditional so are made from seal skin, and the two thumbs are so if they are paddling and one thumb freezes, they can turn the mitt and use the second thumb piece! I did manage to capture a couple good photos of the men rolling, go to photobucket for all rolling photos, here are a couple highlights. It should be noted that, related to the fact that not all Greenlanders roll, not everyone can do all of the rolls. 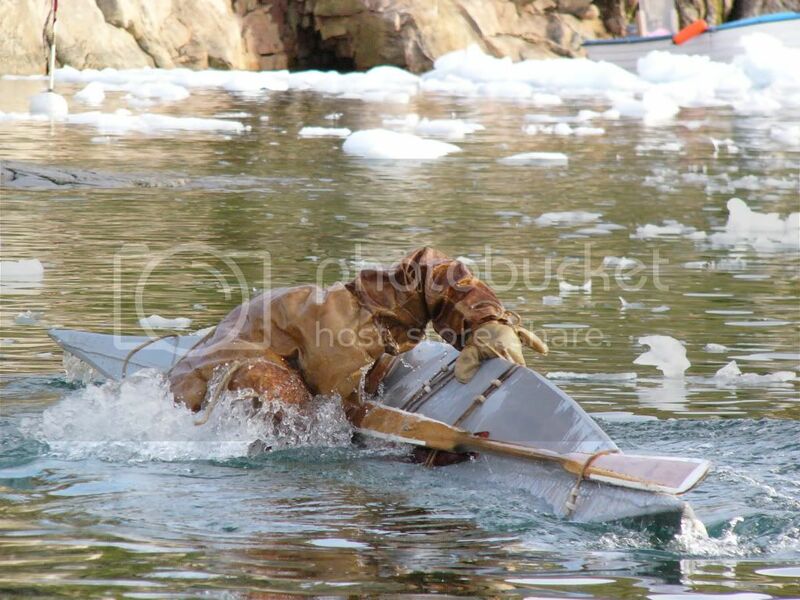 In fact we saw a number of the most competitive Greenlanders miss or even skip rolls. As the rolling carried on into the evening we witnessed a tidal surge. With this surge came quite a bit of ice. 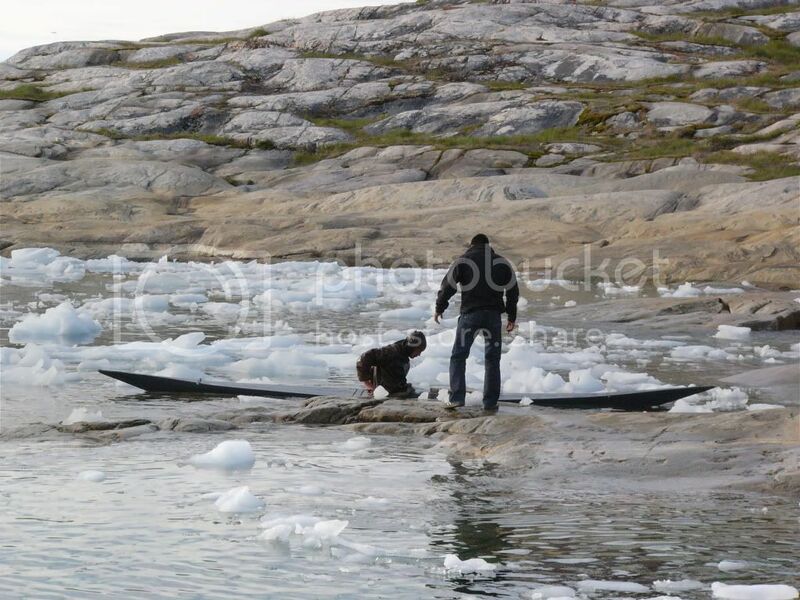 When Maligiaq got out of his kayak the area was flooded with ice. 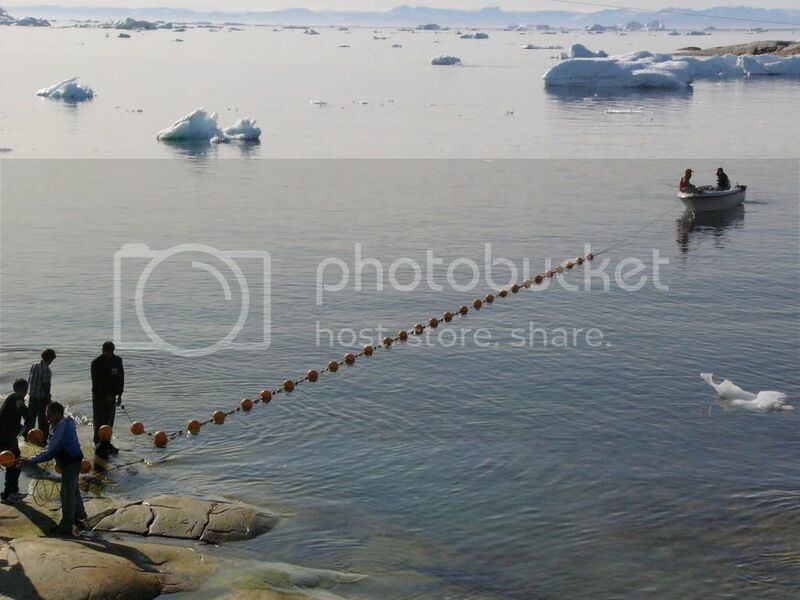 To keep the ice out of the competition area, a motor boat put a rope out between shore and the distance buoys to hold back the ice that was coming in! 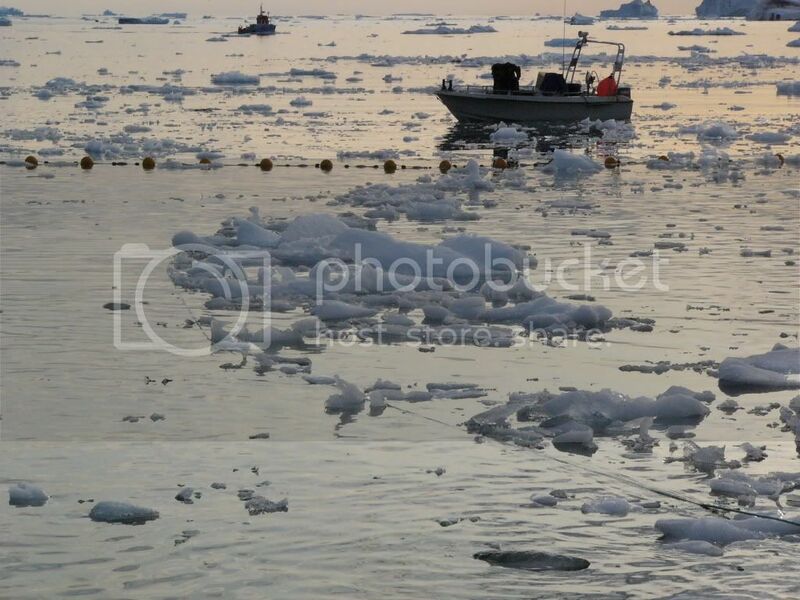 Look closely at these photos and you can see the ice building up against the rope that goes out towards the buoys! I forgot to check my photos on my waterproof camera and just found some more photos to sort through! 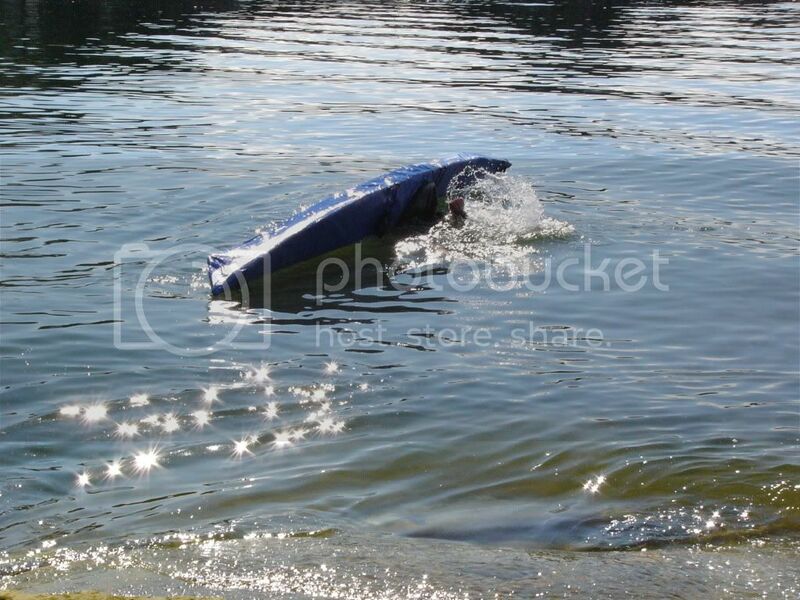 Here is a photo from Richard trying to get into the large SoF that I ended up using for the short race. It was so incredibly tippy there was no way to try the kayak on land without someone stabilizing it or else you’d essentially be getting in sideways! 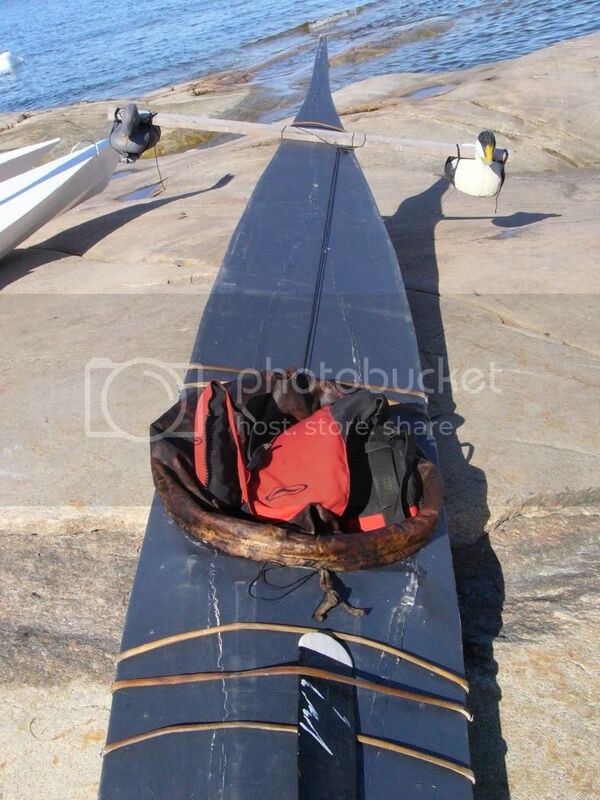 This is the kayak I ended up using for the short race. 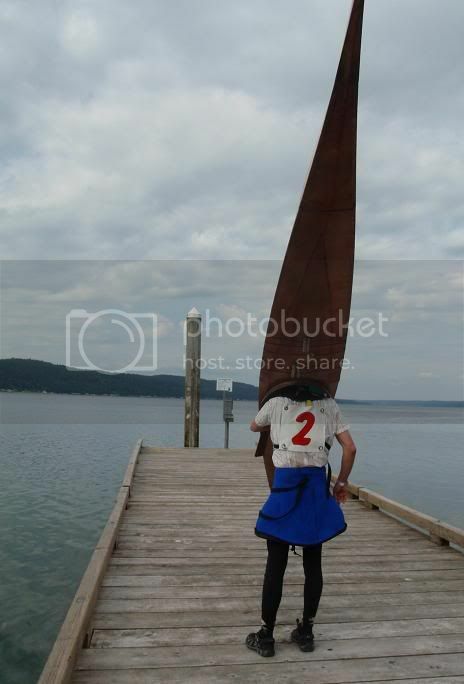 Since this one didn’t fit, Richard tried the big yellow kayak to see how it rolled. 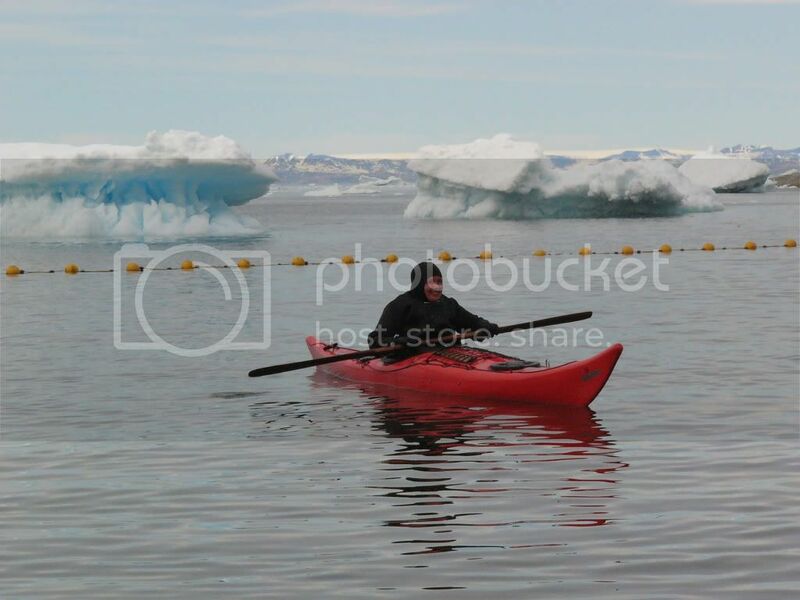 Here is a favorite photo of him in the kayak out there with the icebergs. Someone else was trying out a kayak too. Obviously a local since they got into the kayak without getting anything wet. Also notice the attire. Did I mention that the water is 1 or 2 degrees Celsius? Can you imagine going over in a t-shirt and JEANS? 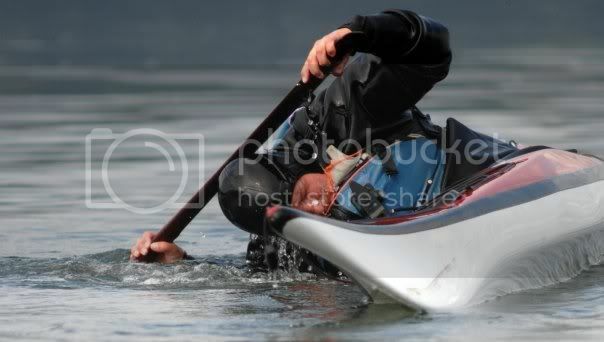 Also notice the hand on the rock where he got in, and the paddle on the other side for additional stability. Also, here is McKinley getting into her kayak to try it out on the first day. She used a bergy bit to stabalize herself to get in. Harpooning was an interesting endeavor. 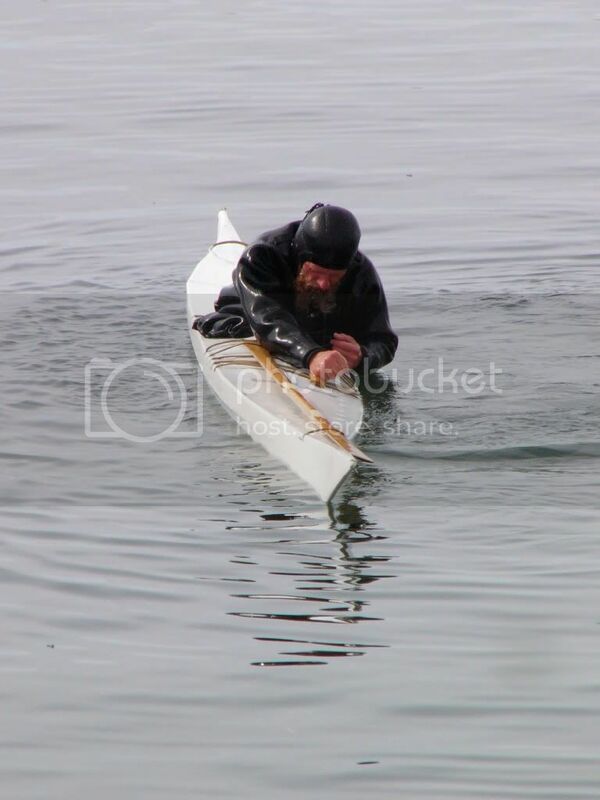 There is a lot of history to harpooning seals and walruses that I’m not going to get into, but the basic objective in the games is to start at a given buoy, start paddling and then pick up and throw your harpoon before your cockpit crosses the first distance buoy. The first throw is to see how far you can throw the harpoon. You then paddle up to your harpoon, rearm it, and then throw it by a second marker, aiming for a circular target 10 meters away. This second throw is for accuracy; a motor boat sits near the target to see what circle (if any) you hit within the bullseye target. Here is a photo of a boat setting out the buoys that are used for measuring distance, each buoy is a meter. They set this out early in the day though, and with the tide coming back in late in the day, there were icebergs getting caught up in the line! 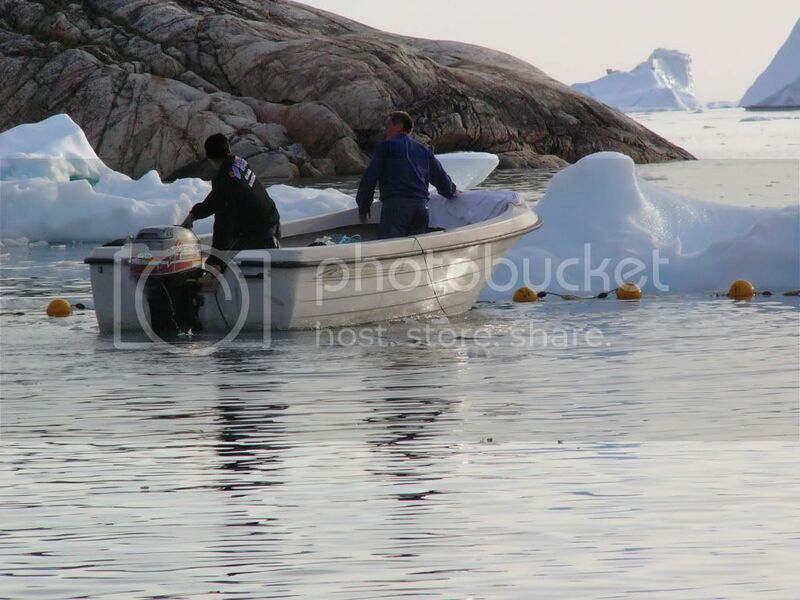 They used boats to push the icebergs away from the line so they could see the markings. By the time they started harpoons on the first day it was getting pretty late. 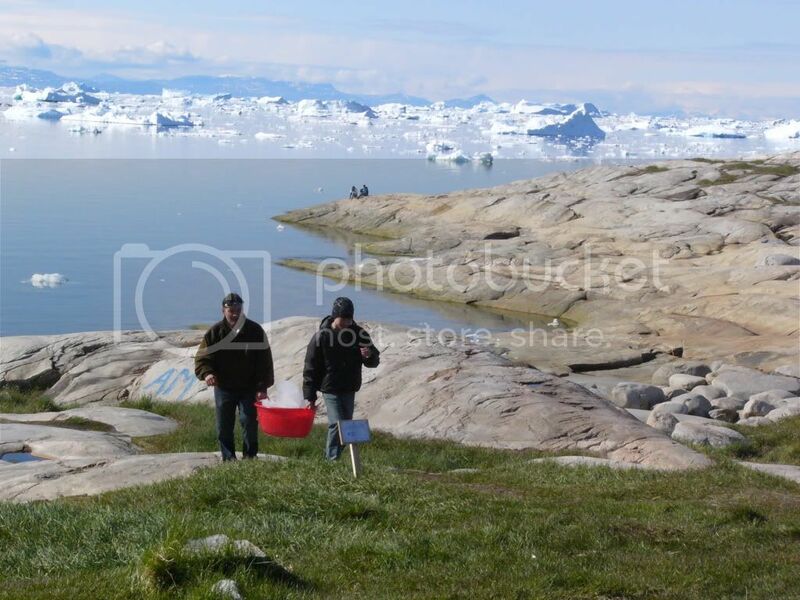 But since Ilulissat is within the arctic circle the sun never goes down; instead it is just a different place in the sky. This made for interesting photography. On the one hand, you can just wait to take some pictures, like pictures of buildings, until the sun is spotlighting the building you want. On the other hand, sometimes it ends up behind the people you want to take a picture of. 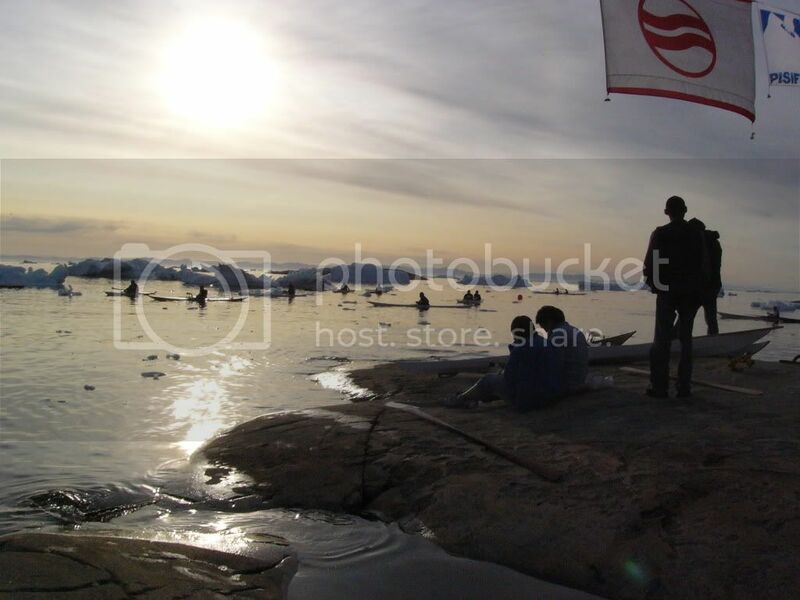 The sun was in the West and therefore behind the harpooners when taking photos which gave a cool effect to many of the photos. My experience with harpoons is rather questionable. The first time I threw a harpoon was a couple weeks before this trip at SSTIKS. At SSTIKS Henry Romer did a session on how to throw harpoons and it seemed that for the trajectory I had a fairly natural throw, I just needed to work on distance. SSTIKS was also the last time I threw a harpoon before the trip so I didn’t get a chance to work on distance, but I so thoroughly enjoyed throwing harpoons that I really wanted to participate in this event. I figured that before this part of the competition I’d get my hands on the harpoon I’d be throwing and get a practice throws in before competing so I’d at least be familiar with the harpoon I’d use (they all vary). Unfortunately, the best laid plans don’t always work out. When I asked John Pederson if I could borrow a harpoon he was eager to help. He went into the Ilullisat club house and found a harpoon that would be shared among many folks. Each harpoon has to weigh at least a kilo so he took it off to get weighed before loaning it to me. In the judging area things were rather busy with weighing harpoons and it was an interesting sight. However, not speaking the language we couldn’t follow what all was going on and we slowly drifted away as they worked out the harpoon situation. This event was delayed about an hour and a half but we just hung out waiting to see when we’d start. There were no kids participating in harpoons, but we eventually heard our names called and we jumped into kayaks with the expectation that we’d just borrow harpoons for our turn. We later learned that there was quite a debate about who could use what harpoons, and who even had harpoons to begin with. The delay was due to a bit of discussion about sharing harpoons between clubs since not all clubs had enough harpoons to go around. Keeping a long story short, Jenny and I finally were able to borrow a harpoon and we took our turns after everyone else did (no practice first). Note that earlier in the day we had also learned that John Pederson has a big plastic kayak. Not wanting to feel super tippy when throwing a harpoon in the kayak I borrowed for racing, I opted for his super stable plastic “boat”. 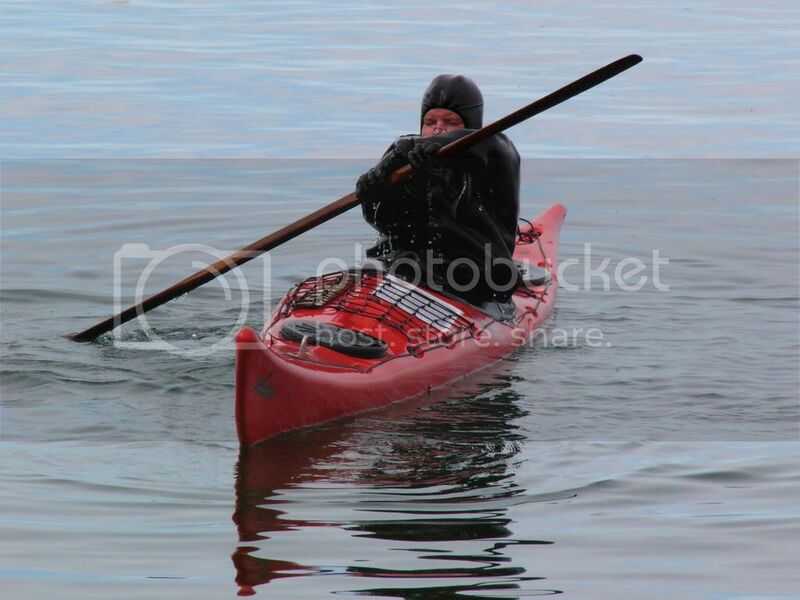 In this huge kayak that I borrowed it was amusing to try to keep the harpoon attached properly. The front of the kayak was so bulbous that the harpoon kept falling out of the holder and nearly falling off the kayak, but I managed to get it to cooperate. Below is a fabulous progression that Matthew Walls took of me throwing the harpoons. What I learned from Henry Romer is that you place your harpoon with the point facing back and the norsaq (throwing stick) near your cockpit so it is easy to pick up. 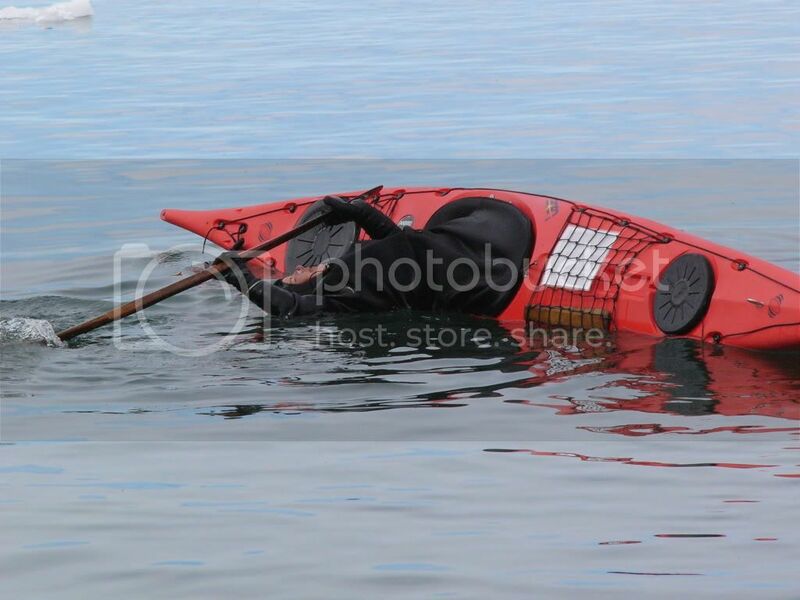 With harpoon in place I started from the red buoy and started paddling. 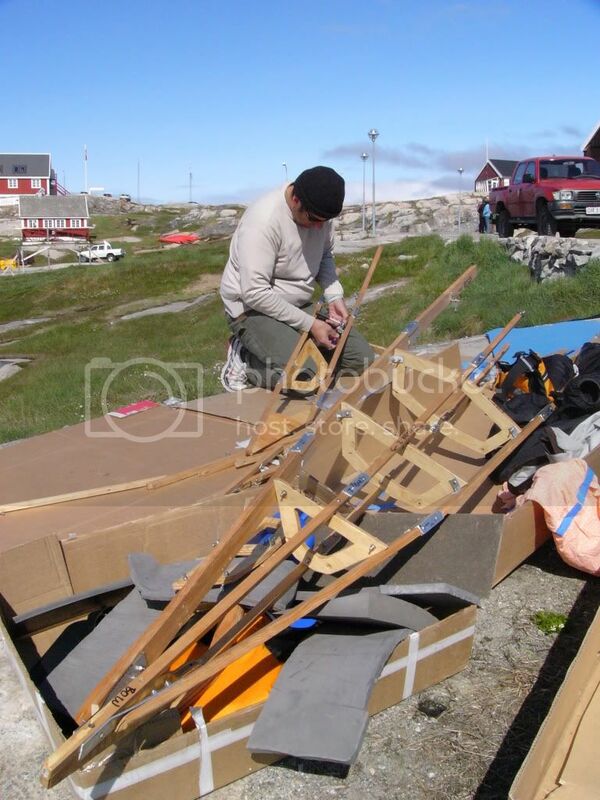 Before the meter line, you grab the norsaq and lift the harpoon and turn it so the point is forward, dragging the tip slightly through the water, as you get into position. You then have the harpoon in a throwing position. You then lean back since you’ll use a sit up crunching motion for part of your throw. You then crunch, keeping your elbow straight, and with a flick of the wrist at the right moment, the harpoon is off on its trajectory. I would have liked to familiarize myself with the harpoon before throwing it and fully remembered my technique, but being the very last thrower in a questionable situation (long story) I rushed through. Given I was throwing with an unfamiliar harpoon and hadn’t touched one for a month after just learning I wasn’t surprised that the trajectory and form was off. Overall, I was glad to even get to participate with whatever was available though, and I still throughoughly enjoyed the experience in the end! I was really curious how I did, and looking at the photos it is clear that I must have thrown the harpoon at least a couple meters. However, as I mentioned in my last post, competition results may not reflect actual performance. I have a feeling that my results may have gotten mixed up with someone else, as the final scores indicate that I have zero points for distance on both throws! As for the precision throw, I’m not sure why they have the target throw for females, as no female hit the target. I will briefly mention that this is where I started to get cold. 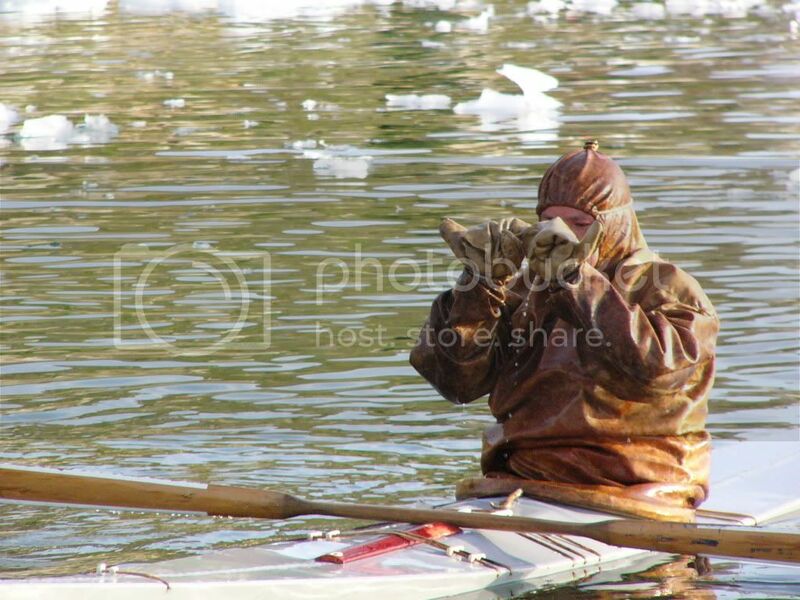 I was sitting on the water for so long waiting for my turn that I started to get a little chilly. It was also getting late in the day, and while the sun was of course still up, the temperature does start to drop in the evenings. 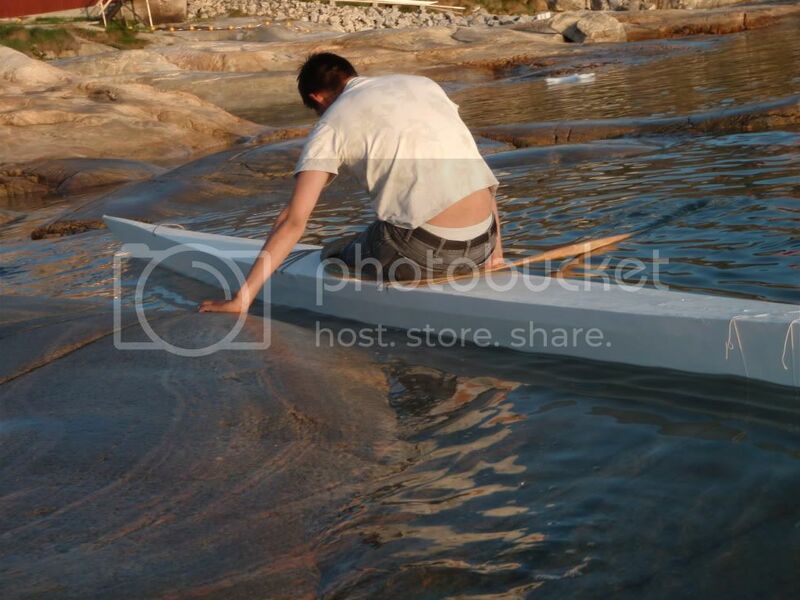 Having to plunge my hands into the water to pick up the harpoon after each throw my hands started to get extremely cold. I hadn’t worn gloves for the race and was fine, but it was a mistake to go without gloves for the harpoons so late in the day. By the time I got off the water I could barely use my hands and they hurt horribly. I survived though and I was ecstatic for successfully throwing the harpoons a couple times. After regaining the use of my hands, I watched the guys (Dubside and Marcel) participate as well. 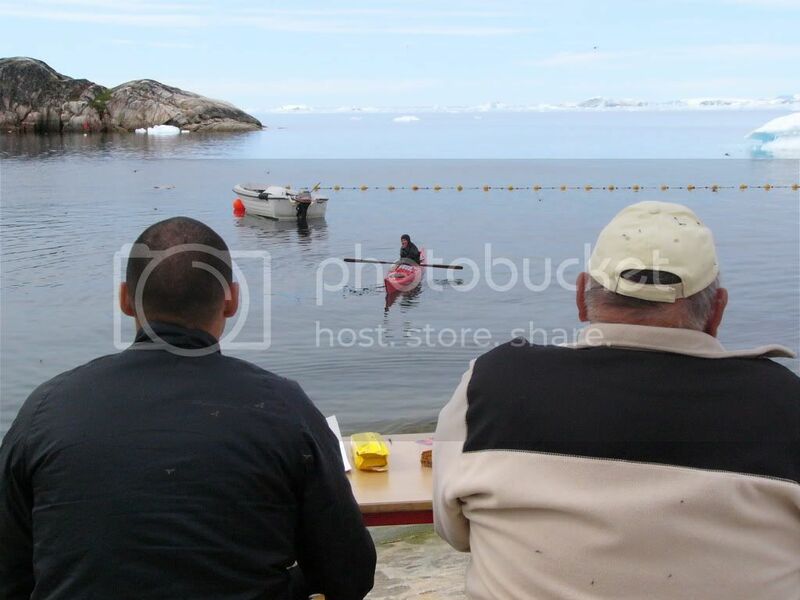 Greenlanders have a very healthy respect for the water. 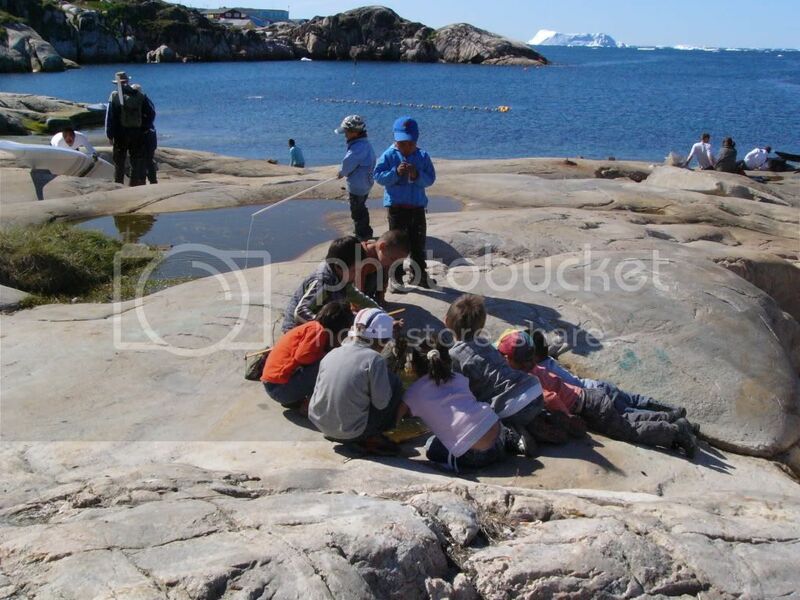 While the kids poke in the pools that remain on the rocky areas during low tide, they tend to stay a respectful distance from the water, especially when it isn’t very warm out. I’m sure we all would have more fear of the water too if we grew up in Greenland given that the water is about 1 to 2 degrees Celsius in the middle of July. 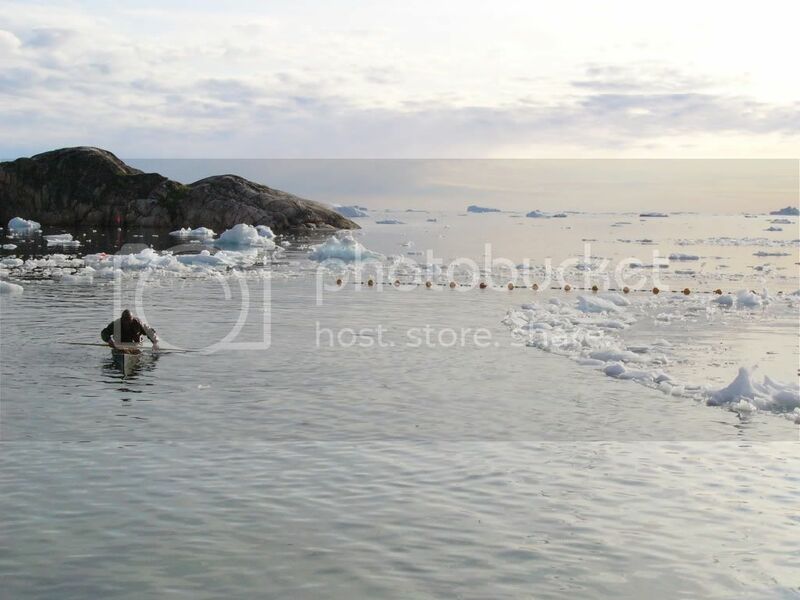 In Ilulissat the water is also full of bergy bits. Iceberg digression: Really massive chunks of ice are called icebergs, but technically it has to be over 5m above the water. Smaller chunks are called bergy bits, and when less than a meter shows they are called growlers. I’m not sure what they call beached bergy bits, but the locals will come down and fill up buckets of ice from those. Not only is the water cold, it is easy to slip in. As the tide goes out, the edges of the wet rocks are quite slippery with green algae. It does dry up rather quickly, but there is always at least a foot or two of slippery rock right along the water’s edge. During our prep day down by the water we saw a kid slip in. His mother started screaming and tried to reach for him. She quickly followed him into the water! With all of the screaming a lot of people started running towards the water, the smartest one was a kayak club member carrying a paddle that he could extend out to her. Before the paddle got there, the dad was at the water edge and he stretched his arm out to pull them up out of the water. You could visualize how it could quickly continue to be a disaster with the father falling in, but fortunately his arms were long enough and his footing held. On one of our prep days, I tried out a couple kayaks in hopes of finding one I could use for the games. 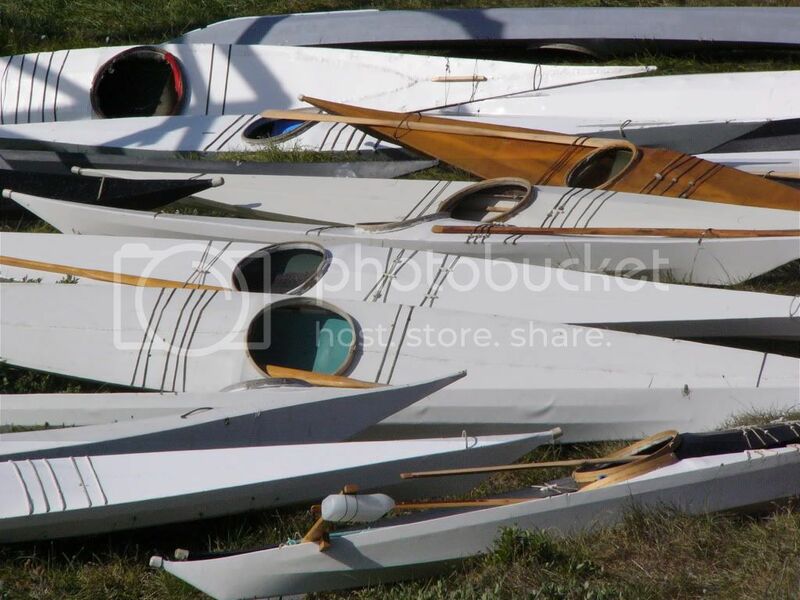 There are tons of kayaks, but there are only so many that we might even possibly fit into. 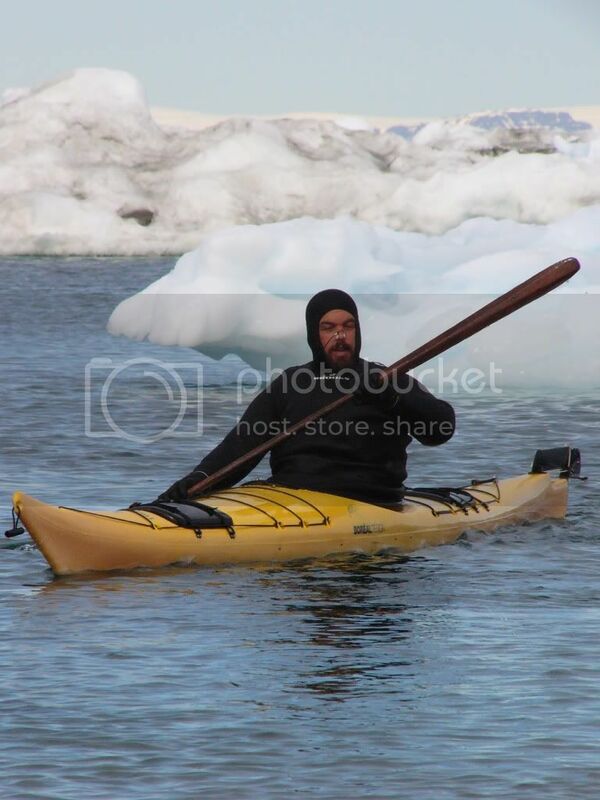 Maligiaq from the Sisimiut team loaned me a big kayak that I fit into (it was intended for Richard to borrow but he didn’t fit in it!). I took the kayak out on the water and tested paddling it. It was rather tippy but I figured it would work for racing. It was mentioned that it wasn’t a rolling kayak but I thought I’d try rolling it anyway just to see if it might potentially work for the rolling portion too. They weren’t kidding though, I wasn’t able to roll it! I was trying a side scull and wasn’t able to come up and stay up on the back deck – it had a high back deck and the tip factor caused me to tip right back over! 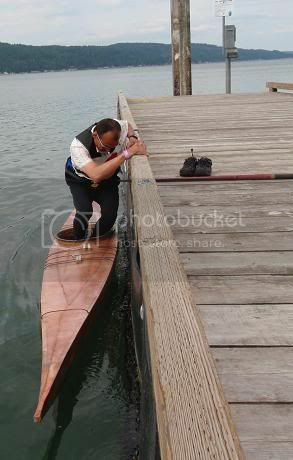 Fortunately, I was close to the shore and started to holler that I might need help as I maintained a sculling brace. Just as someone was coming out to potentially save me I was finally able to get back upright - I tried rolling and my paddle struck bottom! I kept it on the bottom until I was stabilized and upright. After that rolling fiasco I was hesitant to borrow the kayak for a race for fear of going over and not being able to get back up. However, since they have a lot of safety boats out on the water, I decided I’d try it so I could participate in the first race. The first day of the games started with the short race. Each event always started with the kids first, then progressed, first women and then men, through each age group. Sometimes a few age groups were combined. They always saved the most competitive group (25-34) for the very end of each event. It was a lot of fun to watch the kids during their races in the morning. The little kids have outrigging on their kayaks, usually using plastic water bottles, but one even had hunting duck floats. They are really safe with the kids too. In addition to several power boats on the water, there is always one adult paddling alongside each small child just in case. Before getting to Greenland Dubside warned us that there is a “Greenland time” in which things can just shift around unexpectedly or run long/late. With this in mind we were rather surprised when suddenly our names were being called for the women’s race! The schedule originally said our female age group was scheduled for 1:30, but I believe they started calling our names far earlier than that. If anything, we expected things to be late, not early! We made a quick scramble to get ourselves together and into our kayaks. I was in such a hurry that I slid on that previously mentioned algae straight into the water! 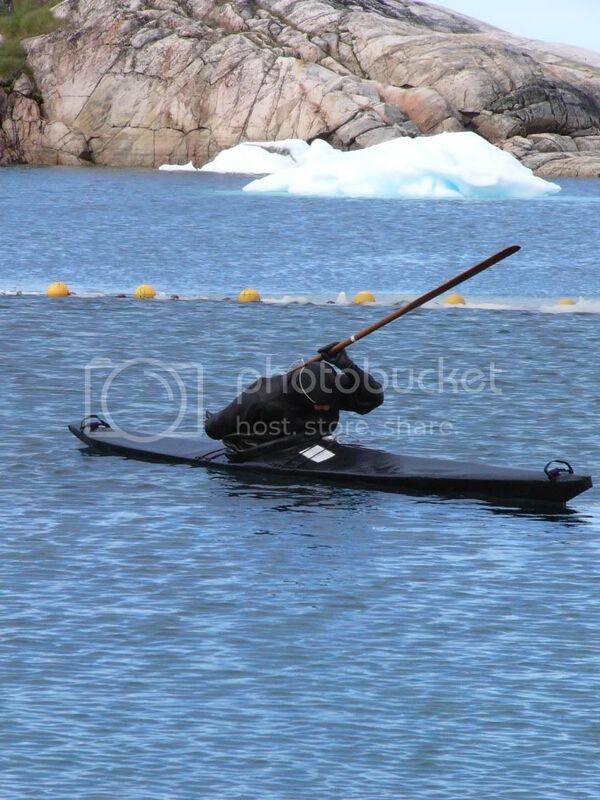 I was trying to put the kayak down in the water to ensure I didn’t whack a borrowed kayak on the rocks. The kayak was safe but I slid straight into the water next to it. 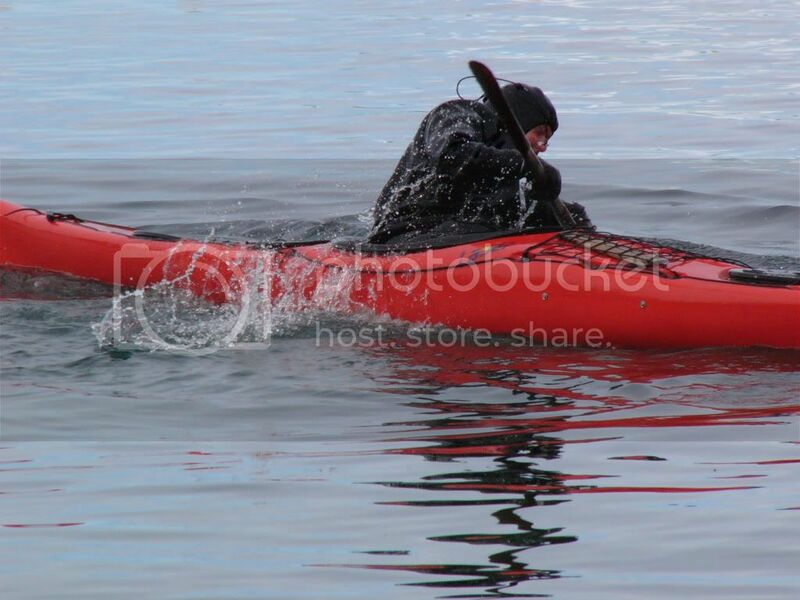 Fortunately I had my dry suit on so I just stood up, jumped onto the back of the kayak and slid into the kayak much more gracefully. 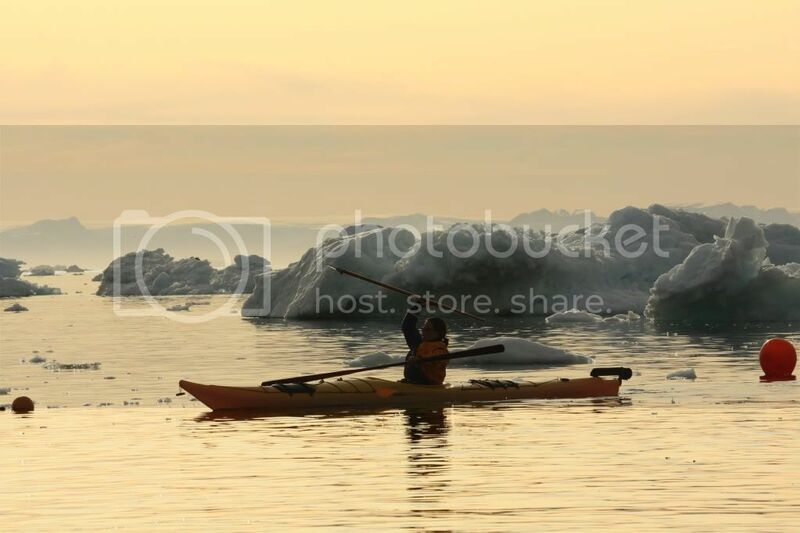 Jenny quickly followed with her kayak and after a bit of struggle to get through the rocks (we accidentally got in an area where the tide was lower than we realized) we paddled out to the start line. Several of the girls were hollering to hurry up! I found it quite ironic that here we were expecting things to run late and the Americans were the ones holding up the games! We weren’t really off to a great start on that front. The race was fabulous though. It started out fairly well and I kept up with the middle of the pack for a bit. However, with the unfamiliar and tippy kayak, I was sort of weaving back and forth a little bit. I accidentally hit the stern of some kayaks a couple times and I don’t think I was earning any friends. 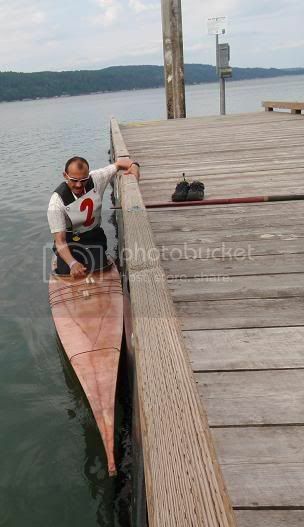 However, I later learned that the race can be a bit aggressive when I relayed a blow I took: the girl in front of me stopped paddling so she could put her hand on the bow of my kayak and push me to a stop and slightly different angle! I fell behind but kept going. I was just out to have a great time and I definitely succeeded in that. 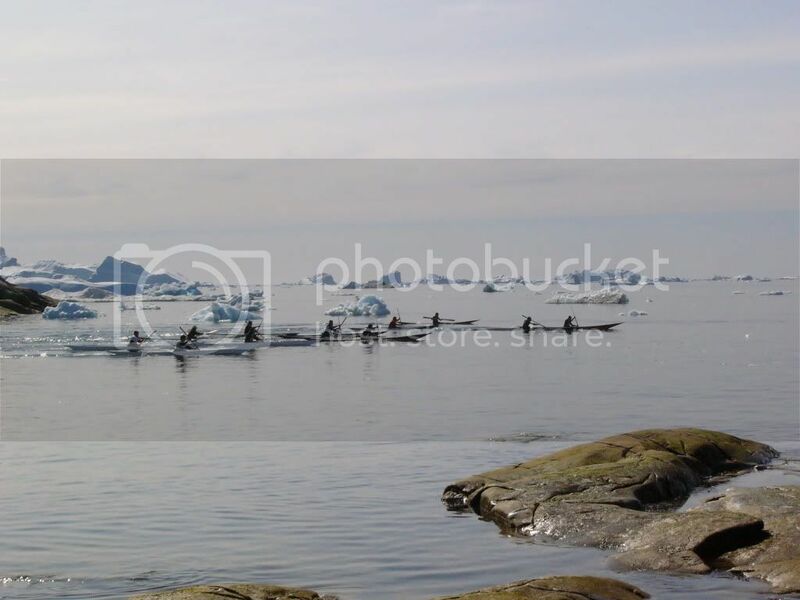 There were a lot of icebergs and bergy bits in the bay so the race route was a scenic adventure. After rounding the buoy there was a brief panic when I heard some sort of crashing behind me. 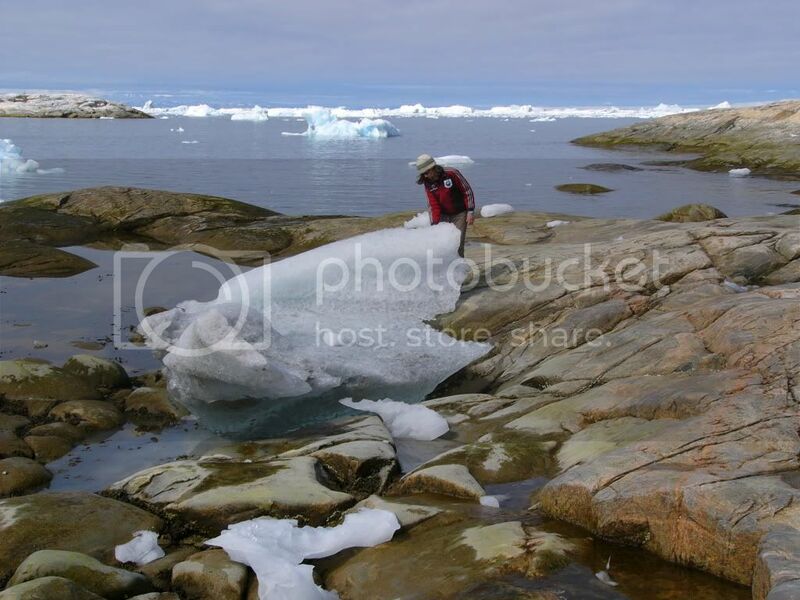 We had previously seen a couple small icebergs roll and had heard bigger crashes when some break apart. There are warnings that icebergs that roll or calve can cause a mini tsunami with 10 meter waves washing up the shore. I'm sure that is just the really big icebergs, but hearing a loud crash behind me definitely spurred me on. No waves caught me, but I did have brief visualizations of surfing in to the finish line! I had a huge smile on my face as I crossed the finish line. 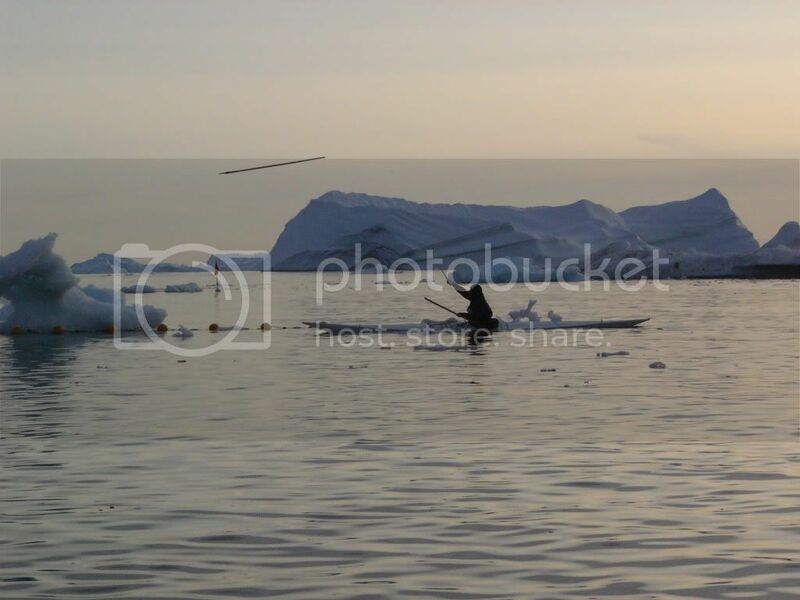 I didn’t place very well, but it was an absolute high getting to paddle in Greenland among the icebergs! After our race we watched the remaining groups compete. The 24-35 men competing (Maligiaq’s group) was always interesting. The men take off so quickly when they start, and the end of the short race was contested with four people right after each other at the finish. 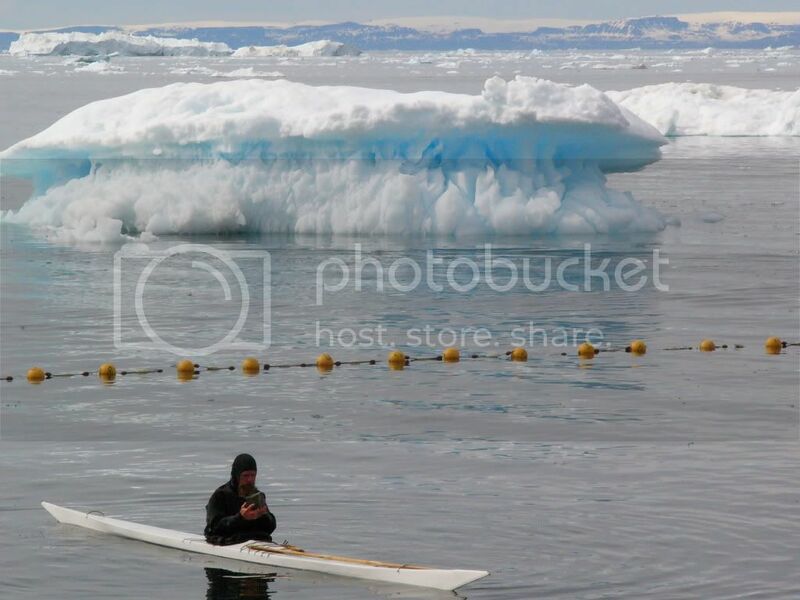 Unfortunately, there was an iceberg in the line of sight for the finish line and the judges couldn’t quite tell who finished second and third. It was claimed that the 3rd place person actually overtook the 2nd place person at the last second! As we quickly learned, results might often be brought into question (see upcoming harpoon and ropes stories). Finally, Sunday, the rest of the teams will arrive today! 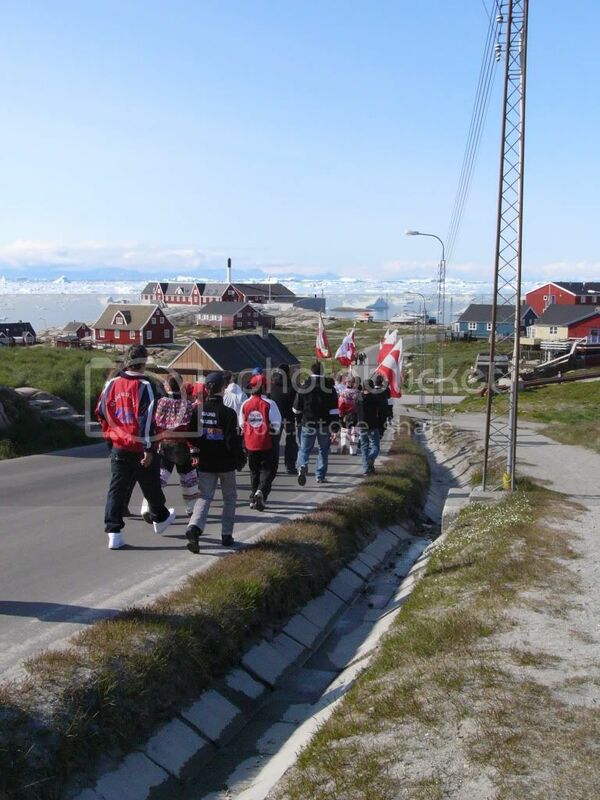 The ferry is scheduled to arrive from South Greenland at 1pm so we have the morning to take care of any remaining needs. We packed up our stuff to move from the hostel to the school where all the out-of-town teams will be staying for the duration of the games. I also came across some locals hanging up fish to dry. Unfortunately the drying area was in the middle of a dog area and the dogs let up quite the whining chorus as they were taunted with the hanging fish. There are dogs all over town but it is a requirement that if they are over 6 months old that they be chained up. You'll often find puppies running loose, like the two on the right, that followed us for part of the parade later in the day. At 1pm we went down to meet the ferry since a majority of the other teams arrive this way. This is the ferry from South Greenland, that picked up teams along the way from Nuuk, Sisimiut, Paamiut, and Qaqortoq. 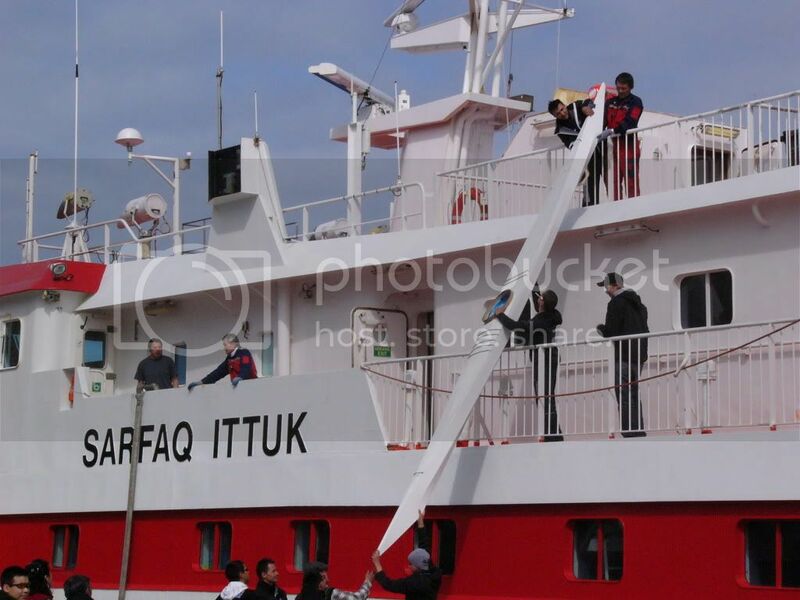 Folks from the farthest south were on the ferry for at least four days coming from Qaqortoq. While most kayaks were sent in shipping containers that arrived the previous day, some arrived on the ferry and had to be handed down from the top deck. Everyone quickly moved up to the school and settled in. We had a couple of hours before the opening parade so we checked out the grounds and met some of the kids from other teams. One item I found amusing in the school was their library. In addition to many local kids books on interesting cultural topics, they also had a pile of localized copies of Harry Potter. In preparing for the parade, many teams put on team jackets or else traditional attire. For our team, McKinley brought everyone US flag handkerchiefs. We toyed with ways to wear them, including putting them on our heads. Somehow Richard got nicknamed El Coolio. 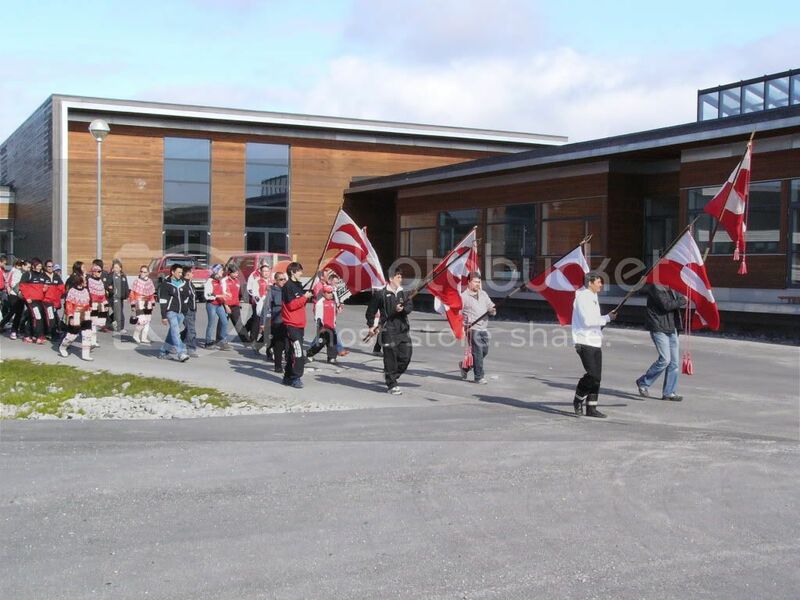 The parade started at the school. Went part way through town along the road. It should be noted that you nearly always have a view of the water and icebergs from anywhere in town. It should also be noted that there aren't that many cars in town so people usually just walk along the road. The parade ended down to the Zions church near the kayak club. The flags were lined up and we all entered the church for service. After a church ceremony we came out to put a wreath on an anchor statue to honor past kayak hunters. A few additional words were spoken and a song was sung. After the ceremony I asked several of the participants to pose for a photo. The women's outfits are very colorful, the top portions are all beads. They are a bright contrast to the men in white and black. 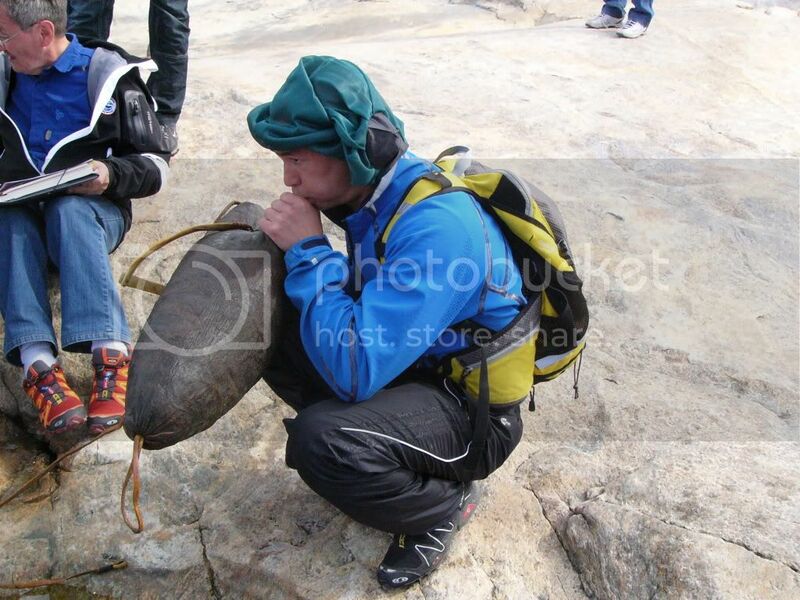 You'll also notice the guy's necklace which is quite common - typically a polar bear or seal claw. That is a common souvenir, but only if you are traveling back to a country that doesn't have a marine mammal protection act. Next, the games begin. Tomorrow I'll begin posting photos and stories from the first games: short race and harpoons. 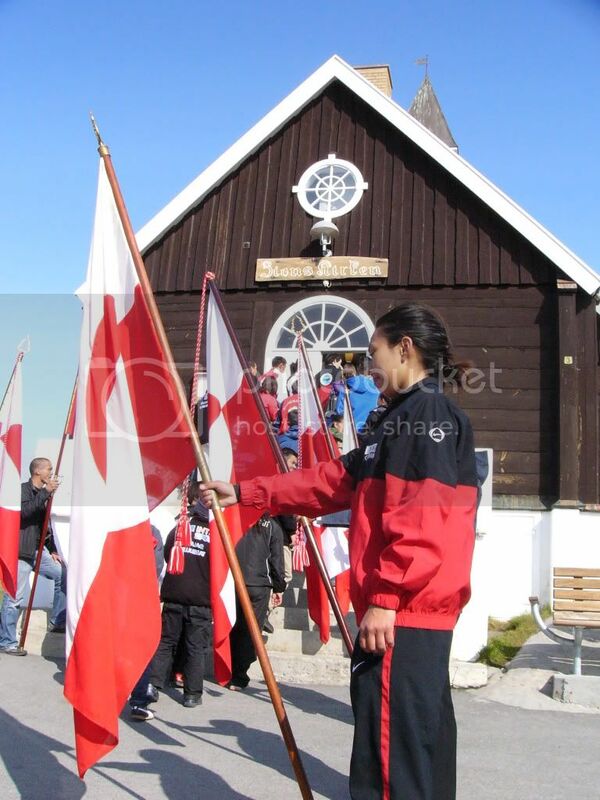 Our first full day in Greenland was a day full of preparations for the competition. 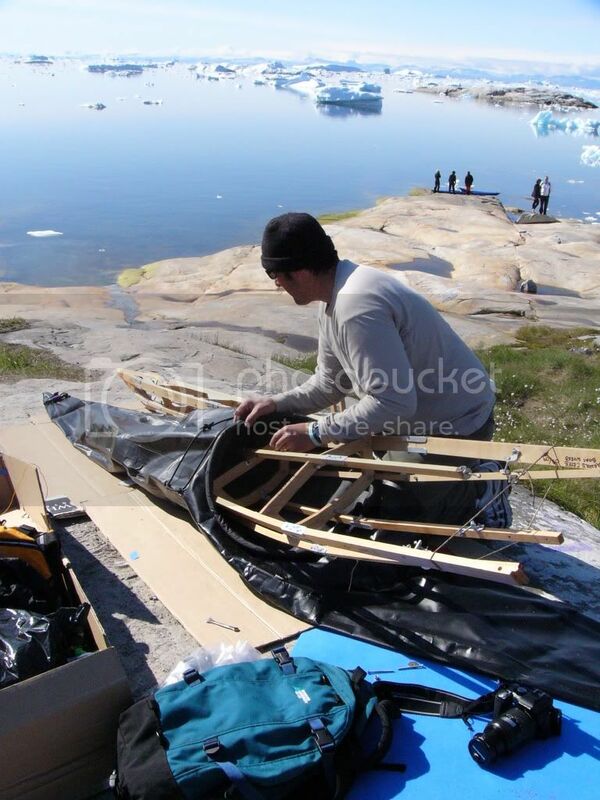 Marcel and Jenny had spent $1,100 to ship two folding kayaks to Greenland. 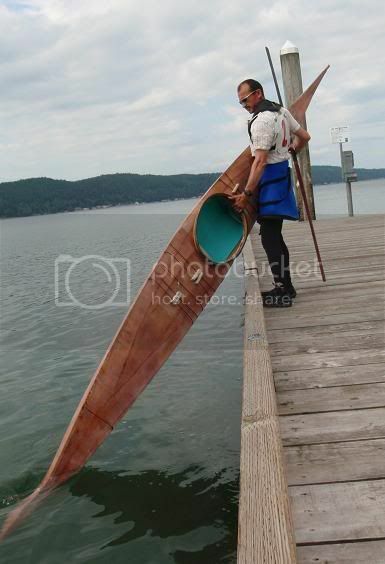 They had built one of the kayaks for their daughter McKinley, and the other one to share between the two of them (men and women compete separately so they would be able to use the kayaks at different times). The kayaks had been sitting in the clubhouse in two boxes. These were brought out early and Marcel and McKinley started in on them immediately. Each part was labeled with a side and number for order placement. In addition, there were two vinyl skins. Black one was for McKinley, blue for the adults. Overall Marcel got the parts together rather quickly. And before long he was slipping the frame into the skins. Soon enough, each one was carried off with smiling faces. McKinley tested her kayak and had no problems. 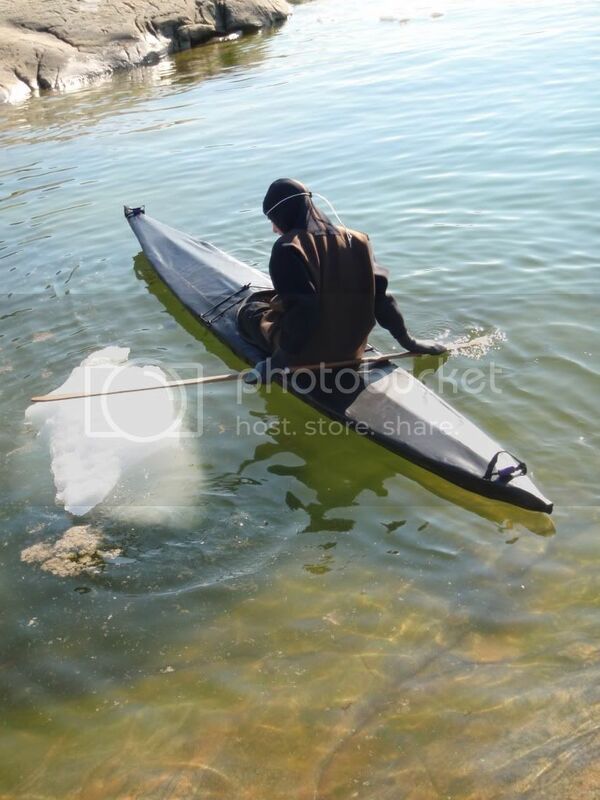 However, the adult kayak was built for Marcel’s size and Jenny had a hard time getting upside down in the kayak. 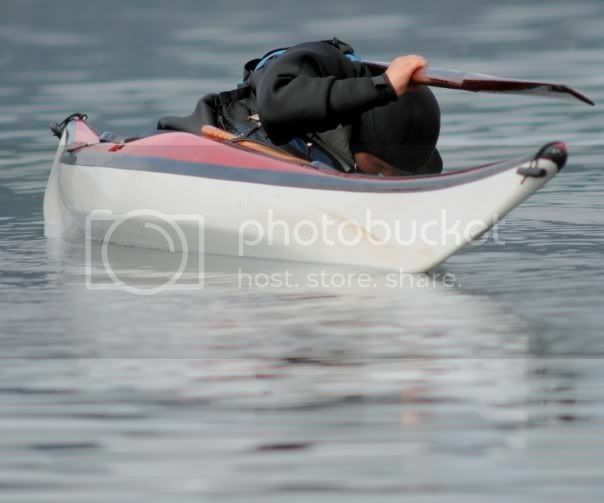 Typically, one wouldn’t complain about a super stable kayak that doesn’t go upside down, but if you want to participate in a rolling competition, it’s best if the kayak goes upside down. 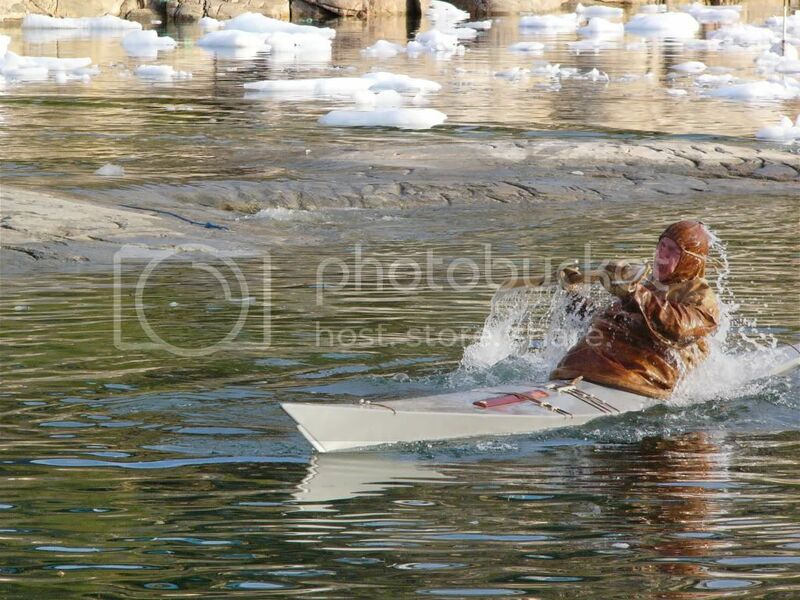 Here, Jenny is half way over and shoveling at the water in an attempt to get upside down. 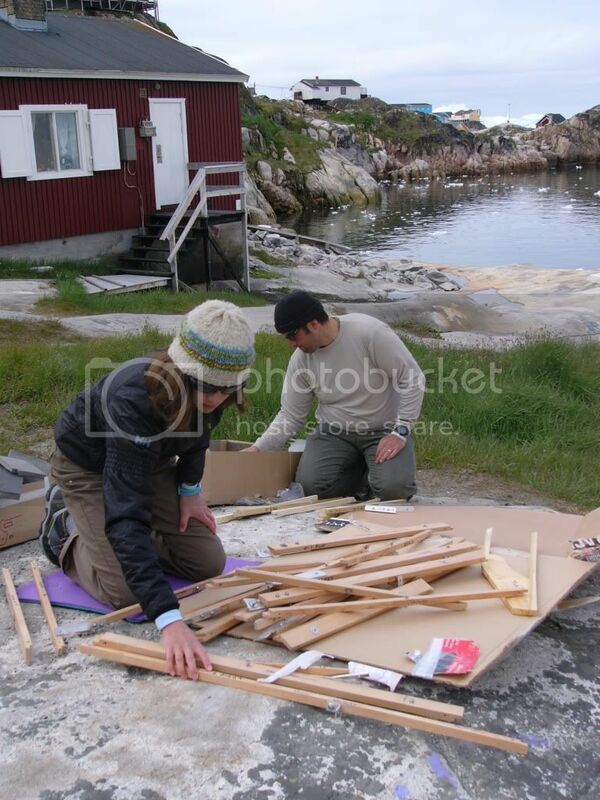 For the local Ilulissat club members, there were other preparations under way. 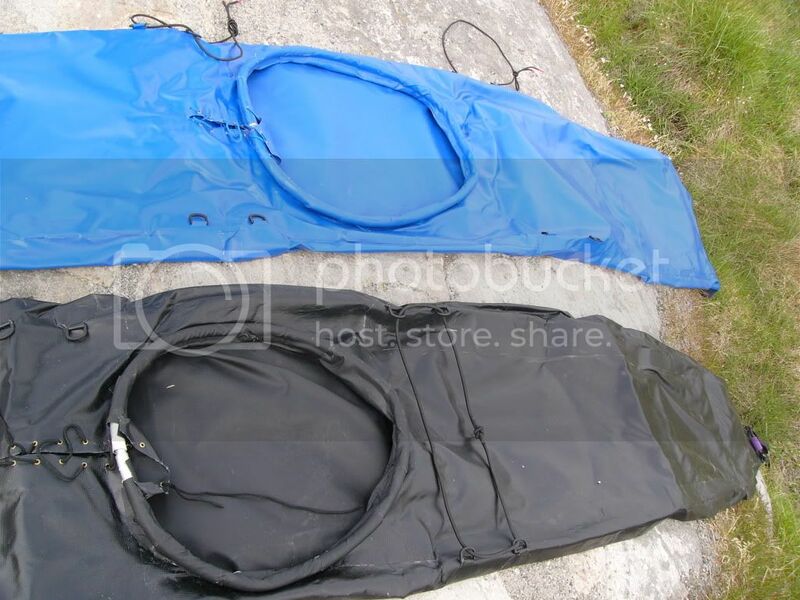 John’s wife worked on a new Aquilisaq (spray skirt) since his had just recently been torn. 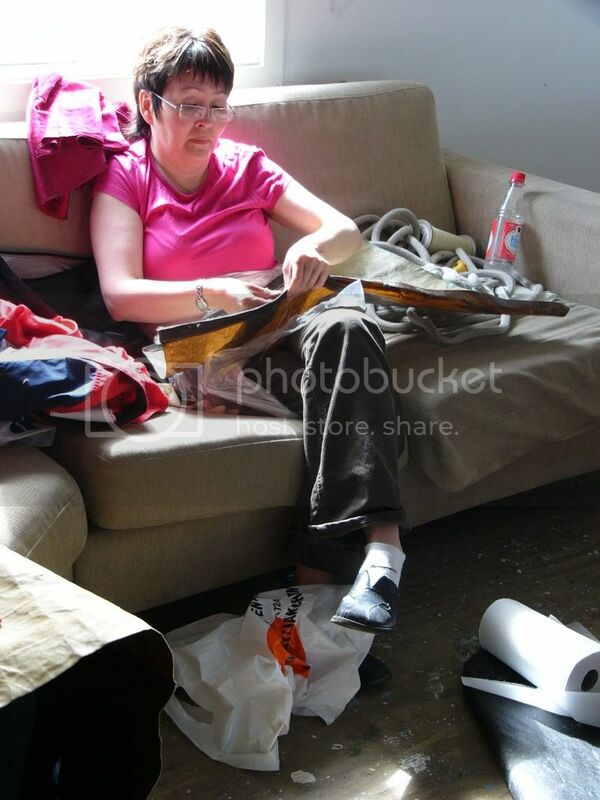 Here she is sitting in the club house sewing a new seal skin. 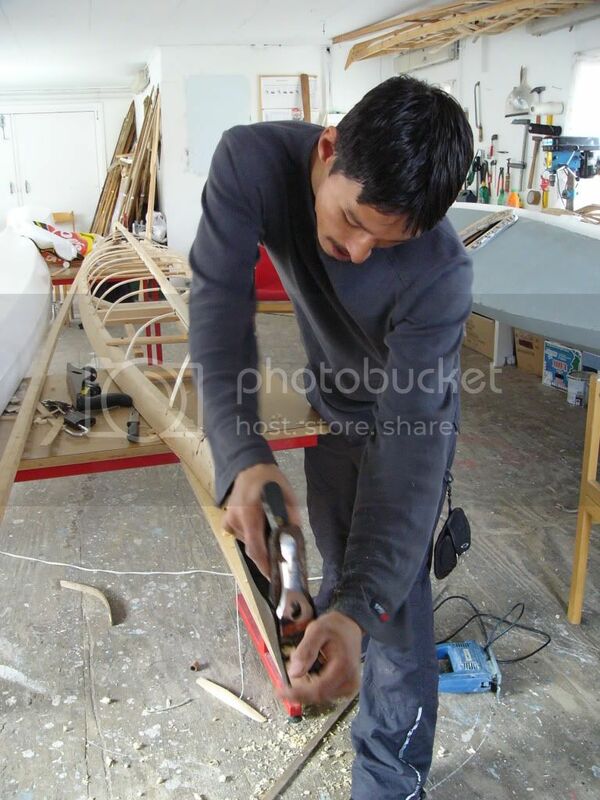 Also in the club house, another member was still working on a frame he hoped to finish in time for the competition. While other kayaks were sanded and received a fresh coat of paint. And bringing newly arrived shipping containers of kayaks over to the competition area. 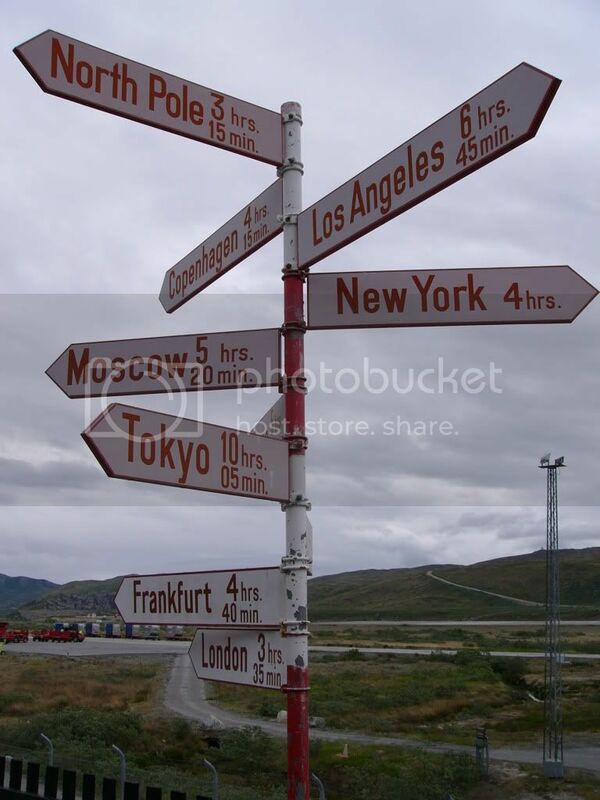 Since many people don’t travel to Greenland, from the states anyway, it is a bit of a trick to get there. There are really only two options for flying to Greenland: Iceland Air and Air Greenland. At the time of our trip, going with Iceland Air meant going through the Midwest or East coast, then Reykjavik (Iceland), then Kangulussuaq (Greenland) then finally Ilulissat, our final destination in Greenland. Not only was this option more expensive, but it had more potential points of failure with layovers. We chose to take Greenland Air. This option requires that you first go to Copenhagen, Denmark, as all of Air Greenland’s flights are either within Greenland or to Denmark. At least the flight to Copenhagen was a direct, 9-hour flight with SAS but the irony with this option is that you fly right over Greenland about half way through the flight to Copenhagen. To avoid any missed flights with delays due to different airlines, we stayed overnight in Copenhagen. Note that while flying through Copenhagen was cheaper than going with Iceland Air, it still cost about $2,000 per person for just the flights! Getting to Greenland is expensive! In Copenhagen, we met up with five other people who would be on our US team: rolling/ropes guru Dubside, plus Jenny Owen, Marcel Rodriguez, and their daughter McKinley. 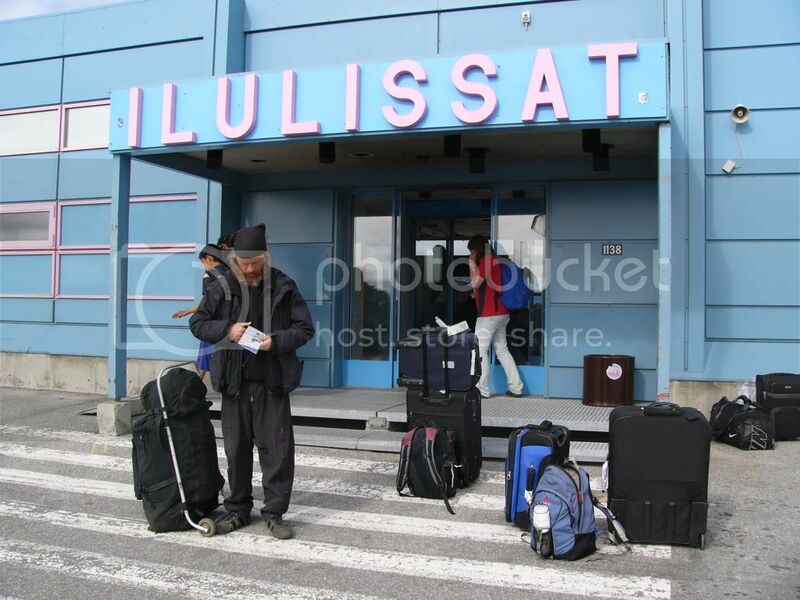 Together we all flew to Kangerlussuaq. We had a brief layover here and had time to take a picture of this sign outside the airport. With Los Angeles only about 7 hours away, I wonder how long it is to Seattle, it took a lot longer than suggested by the sign! And we went North from Kangerlussuaq so we were even closer to the north pole in the end! We received an excellent tip to sit on the right side of the plane for the flight to Ilulissat. 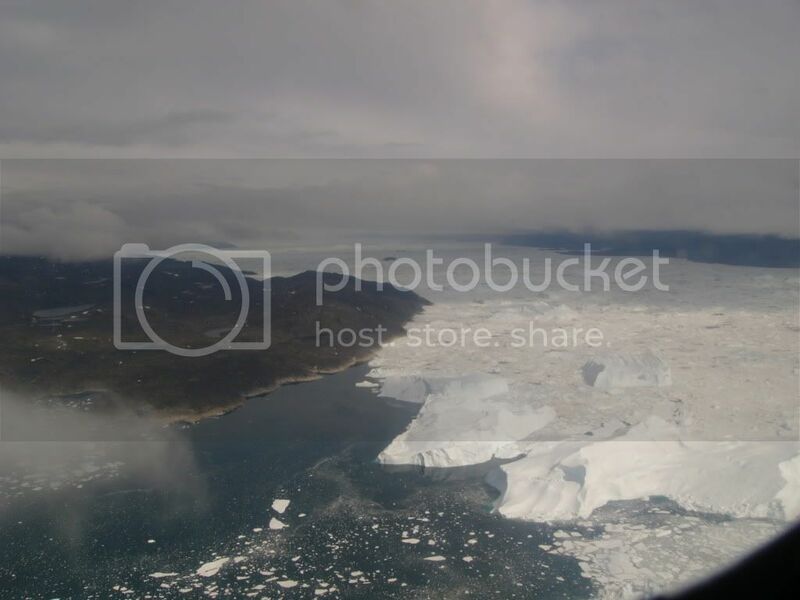 On that side of the plane we had a fabulous view of the icefjord just outside Ilulissat (good place to mention that ilulissat is the Greenlandic word for “the icebergs”). This icefjord is a UNESCO World Heritage Site, it is the world's largest tidal glacier. We also had a nice view of the town before getting to the airport. Here I’ve quickly identified the school where we stayed as well as the local kayak club (spelled with a K in Greenland) where the events took place. 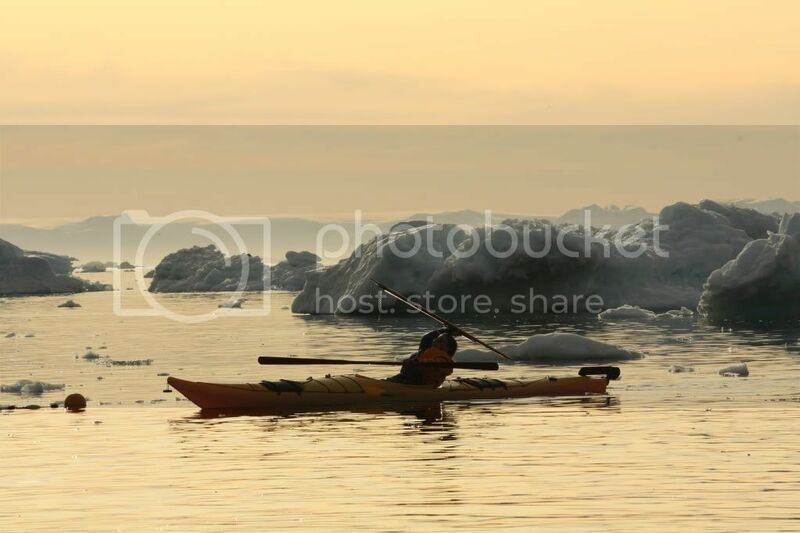 Notice the icebergs you can see in the bay near the kayak club. Somehow we lucked out on all of our flights and got to sit in exit row seats on every flight. We were therefore checking out the safety cards and found this Air Greenland one so amusing we had to take a picture. 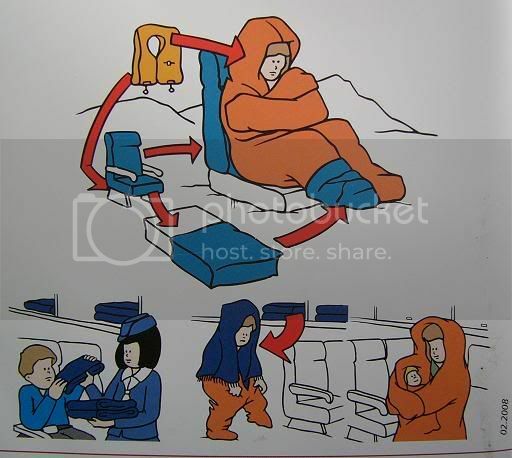 We still haven’t figure out why the diagram shows the person in the warming suit putting the seat cushion on her foot! Perhaps it is like wearing booties over your dry suit socks to keep from wearing a hole in them, but if you're stuck on the frozen tundra due to a plane crash you probably have bigger things to worry about. We waited a little while outside the airport in hopes of getting a taxi but it is a tiny airport at the end of a road outside of town. Without a cell phone and not seeing a phone in the airport we were unable to call a taxi. We finally decided to start walking and thankfully a manager of a local hotel, who stopped to ask us if we intended to walk, gave us a ride to the hostel where we stayed the first couple nights. All in all it was a long trip to Greenland but we made it in one piece! Note that Greenland is five hours later than the Pacific Coast, but we had to travel to a time zone with a nine-hour time difference in order to get there. 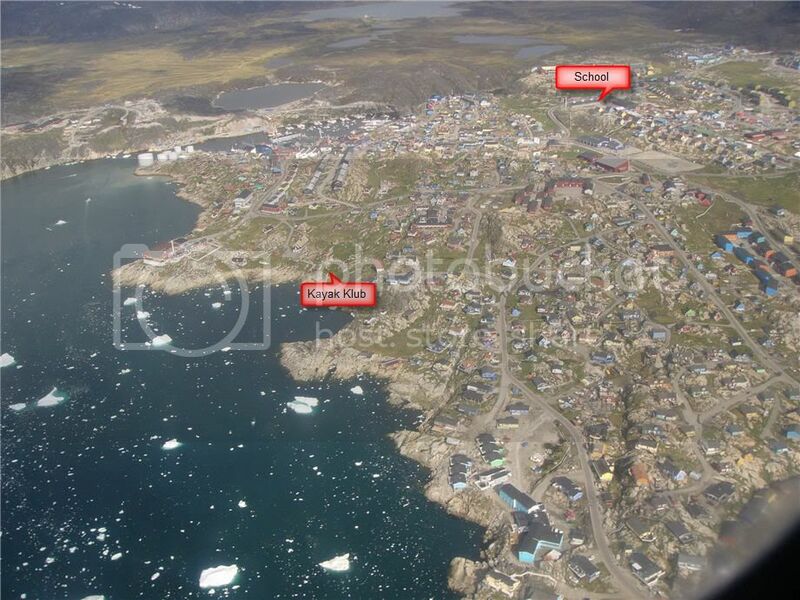 Ilulissat is the 3rd largest town in Greenland, with a population of 5,000. There are about 6,000 sledge dogs in the town, so you can almost always hear dogs howling. It is also within the Arctic Circle so in July the sun is up 24-hours a day. I guess I’ve been admitting it for awhile now since I can’t do a lot of rolls in my own skin on frame, but I feel guilty for saying it. Like I’m a fraud. Trust me, I’ve been using a lot of excuses. But the rolls that I can do absolutely depend on the kayak that I’m in. Sure, not all my rolls are 100% solid, but doing a hand roll in an Illusion is so effortless it is hard to deny that rolling might depend a lot on the kayak, at least for the intricate stuff like rolls without a paddle. Sure, there are trick rolling kayaks that you can do every roll in, but it isn't those kayaks I can do rolls in (actually, I had a harder time in some of those!). I once heard Dubside mention that rolling can be kayak-dependent when he tried to do a hand roll in Richard’s kayak! Granted, Dubside is a fraction of Richard’s size, you should have seen him engulfed in Richard’s Mariner Max, but he just couldn’t quite bring the kayak back around without the paddle. Given that he is the rolling master, this made us feel a little better. 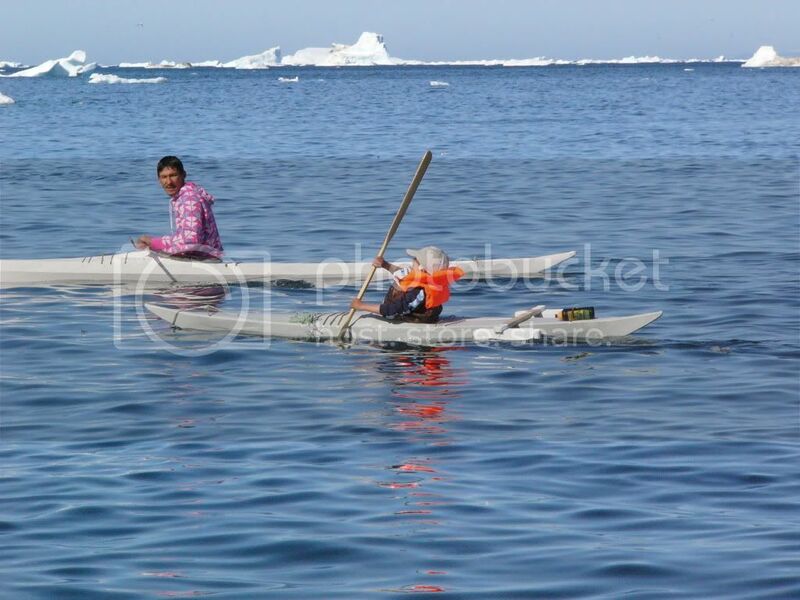 My favorite excuse is still from Maligiaq (repeated kayak champion), he says the chines on my SoF are too hard. 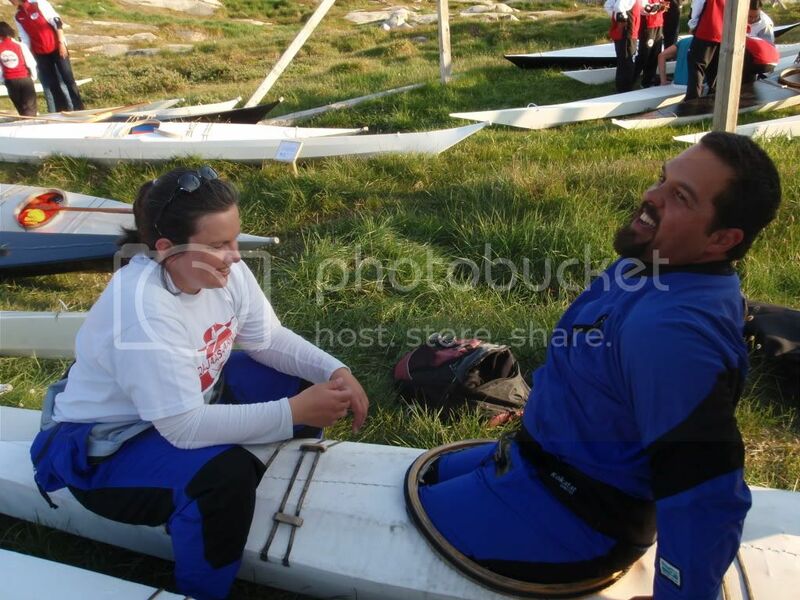 But still, it is frustrating to not be able to do all my rolls, especially in my own kayaks! At this point I must briefly digress, as I have to say a huge thanks to Barb and John for repeatedly letting me borrow their kayaks for practice!!! This kayak-dependent rolling phenomenon has had me extremely antsy for awhile now. 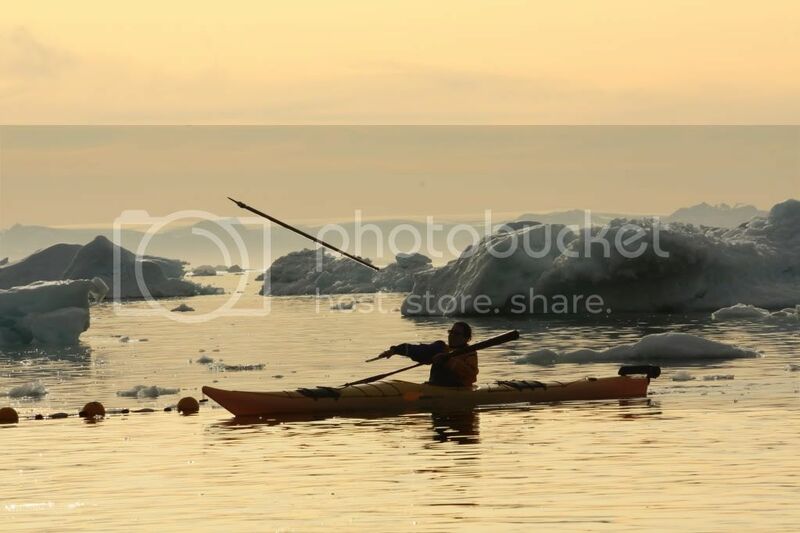 For our trip to Greenland I’m hoping to borrow a kayak, but if I can only do my rolls in specific kayaks, will I really find a kayak that I can compete in? Will I be able to do a hand roll, or will I have to skip that progression, including the fist roll and brick roll? I really wanted to at least attempt a brick roll in competition, I’ve managed to do that roll twice, but the brick will probably end up at the bottom of Disko Bay given my current track record! Fortunately, over the last week as I’ve finally started to pack, I’ve gotten much more excited about just going to Greenland and enjoying the experience. It is going to fabulous, and I honestly haven’t even worried very much about the rolling anymore. Sure I’d love to compete, and hope that I’ll be able to at least do a short race, toss some harpoons, and do the rolling part of the competition, but I’m much more excited now about the experience in general. Something that helped was reading Helen Wilson’s article in Sea Kayaker Magazine about attending last year’s competition (I’d post a link but I haven’t found one and, besides, I think you should just buy a copy). 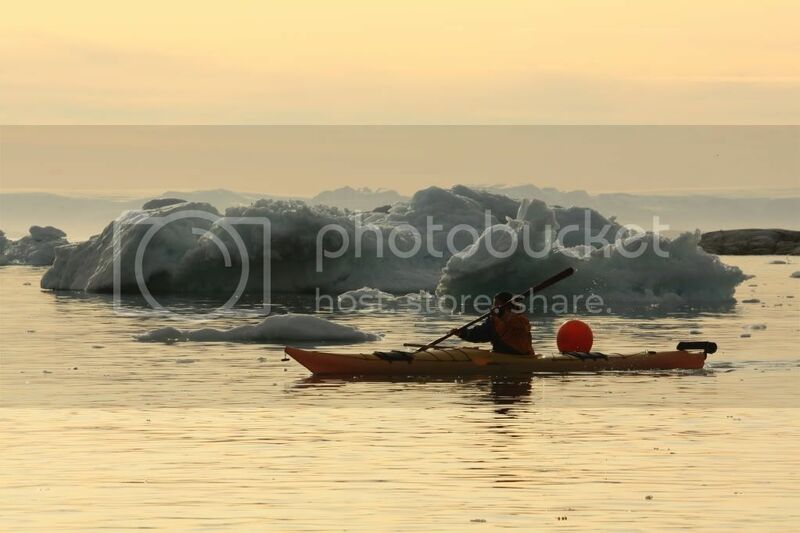 The article made me even more excited about the trip and far less anxious about whether or not I’ll have a kayak to borrow in Greenland and if I’ll be able to do hand rolls. So, with that, I think I’m mentally ready to go! Bags are packed and have been weighed repeatedly to ensure they’re under the limits. Showers are taken and the water heater is about to be shut off. Cats are prepared for a cat sitter, and there is not much left to do but practice my Greenlandish on the airplane and read. We’re not bringing a lot of electronics so unless there is a computer where we’re staying along the way and I feel like checking in, you won’t hear from me until we’re back. At that time, I’ll start doing regular posts like I did for the Alaska trip, with trip details and photos each day mapping to another day or two of the trip. Thanks for all the well wishes. There is no doubt we’ll have a fabulous time, and we’ll see you when we return. Bob Burnett took some photos of me rolling during the SSTIKS rolling demo. 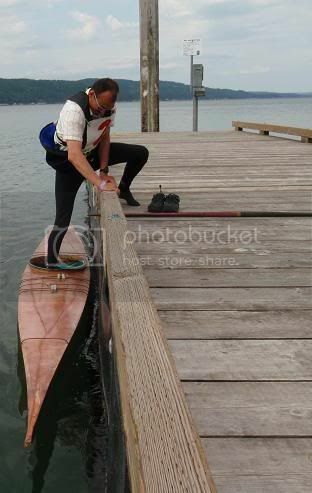 The spine roll - I always come up from this into a static brace and get stuck, I haven't figured out how to get all the way back up onto the back deck while still holding the paddle with both hands! 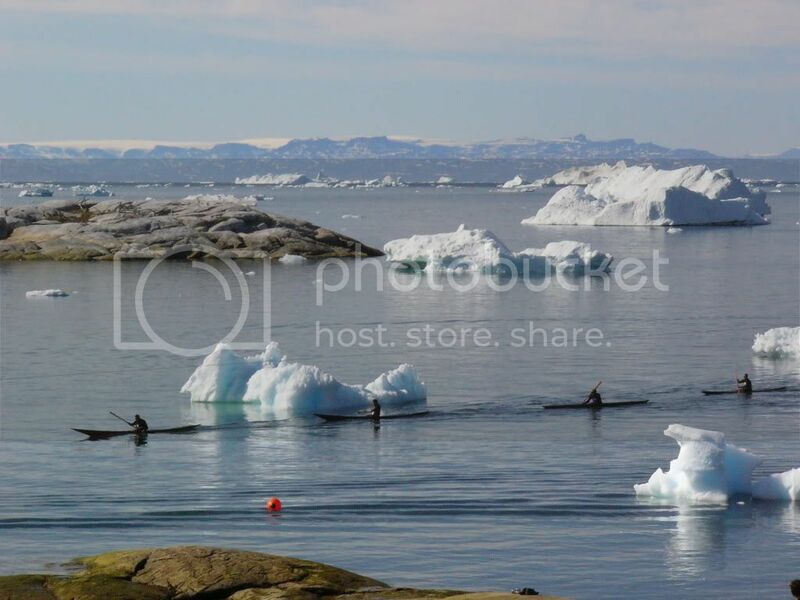 Standard Greenland Roll with paddle behind the head? I think that is what this one is given that the norsak is on the deck and I'm not seeing the paddle anywhere. I just recently started getting this one, can do this on both sides. Or else it is me doing a hand roll or getting stuck in the spine roll, I can't see either hand/arm so I'm not positive what this is me doing. Reverse Sweep with Paddle behind the head - It is interesting to see this photo cause I can now see how close I am to actually making it back up! Forward ending rolls are hard with a PFD (hard to lean as far forward), but it looks like I need to square my shoulders more to the water when coming up, and possibly get the paddle closer to the surface, and I should probably have the kayak more upright by this point. It should be noted that I also participated in the SSTIKS qausi rolling competition. We only did rolls on one side and I'm proud to say of all the rolls I can do, I can do nearly every one on both sides. I didn't do very well in the competition though, I wasn't able to do my hand roll which also meant I skipped the closed fist roll and brick roll which I managed recently. I realized later that it was because at SSTIKS you have to wear a PFD. This is fine, but it made me so bouyant I became complacent about my hand roll and stopped doing the right motion! Of course, I didn't figure out what was going wrong with my hand roll until after the competition. In Greenland you're not allowed to wear the PFD at all so that will be out of the way and I'll have perfected more rolls by then. 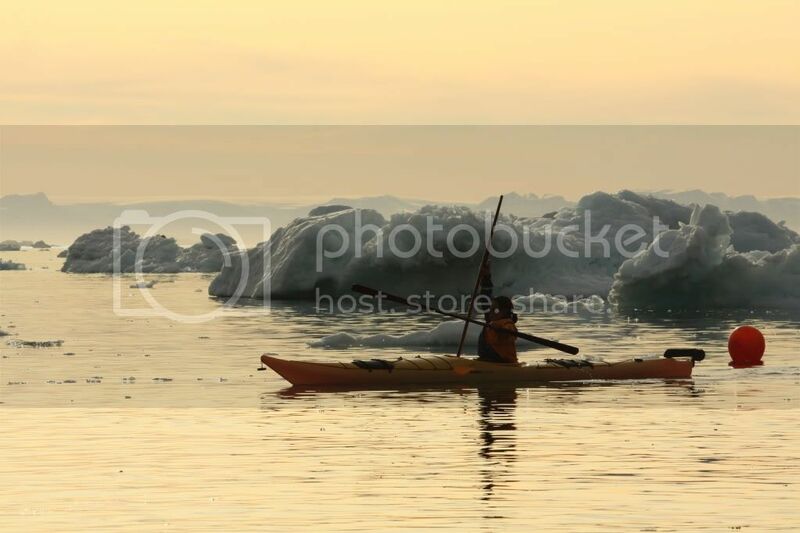 I'll have to figure this kind of entry out for Greenland since I imagine while I might have gear to stay dry, I may not want to freeze my toes in the 2 degree (C) water!